Wellington Village's 100-Year old Houses in 2019! Within weeks, the purchases were being registered at the city registry office, loans and mortgages taken out, and houses began to be constructed in the former farmland, which had been sitting vacant for nearly 30 years. 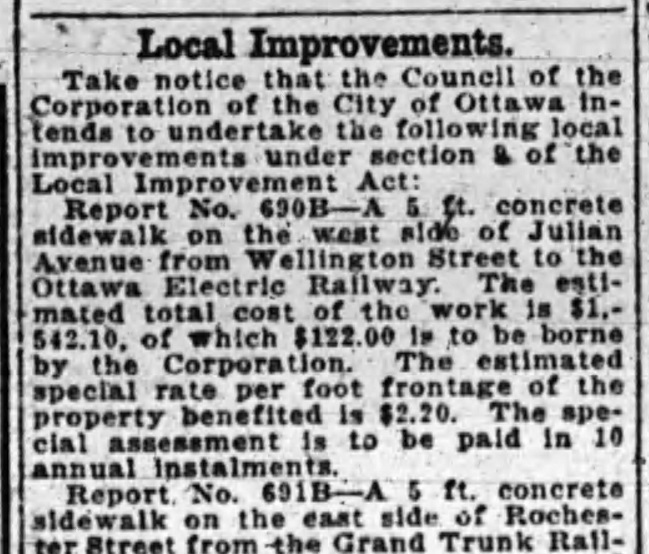 Some of the key figures involved with the OLA were also part of the Ottawa Electric Railway. They invested in property alongside the streetcar line well prior to the streetcar going in, knowing that the land would increase substantially in value over time. The group had incredible vision, and also incredible patience. An unsteady economy in the first two decades of the 20th century along with WWI made it difficult for the company to pick the right time to sell. 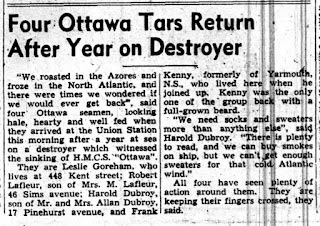 1919 was that year, with WWI over with and things looking upwards, not to mention a housing shortage crisis in Ottawa. As 2019 is thus the 100th Anniversary of most of the present-day Wellington Village community, expect there to be a couple of community events celebrating this great milestone! More on that soon enough. The inspiration for this post came from someone I spoke with whose prior information she had about her house dated it to 1919. She was planning a 100th birthday party for the house, and had asked me for any interesting historical details I could find out about the house. 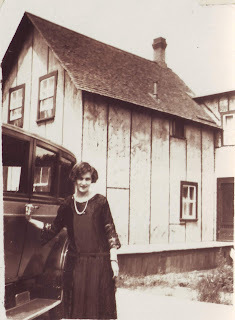 Unfortunately for her, after a little digging, it was discovered that the house only dated to 1929. Just goes to show you can't trust realtor listings or the CMHC. In fact, there is definitely NO definitive source out there that banks construction date information for houses in Ottawa. And since a fire at City Hall at one time destroyed most of the building permit data up to I think the 1950s or even 1960s, it is only through historical record sleuthing that the true date of construction for a house can be found. 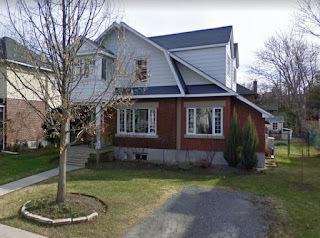 So with that in mind, I thought it would be a fun, and timely idea, to come up with a list of the houses in Wellington Village that were indeed the original and first group constructed, that truly are celebrating their 100th birthday in 2019. 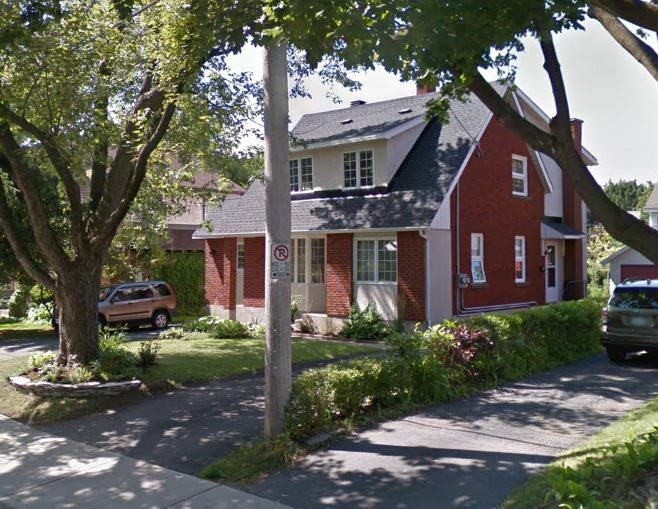 There are 13 original houses still standing in Wellington Village that were built and most likely completed in 1919. They are profiled below! First off, the exceptions. 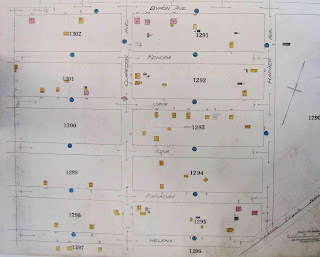 When the auction of 1919 happened, there were actually houses that already stood within the boundaries of what today we know as Wellington Village. Wellington Village goes all the way west to Island Park Drive, which is about 700 feet further west than the land the OLA owned back in 1919. The OLA owned the former Stewart farm, which ended at the Ottawa city limits; everything on the west side of Western Avenue, and west of the western edge of Elmdale's playground (Mayfair Avenue, Piccadilly Avenue, etc.) was in Nepean until 1950. 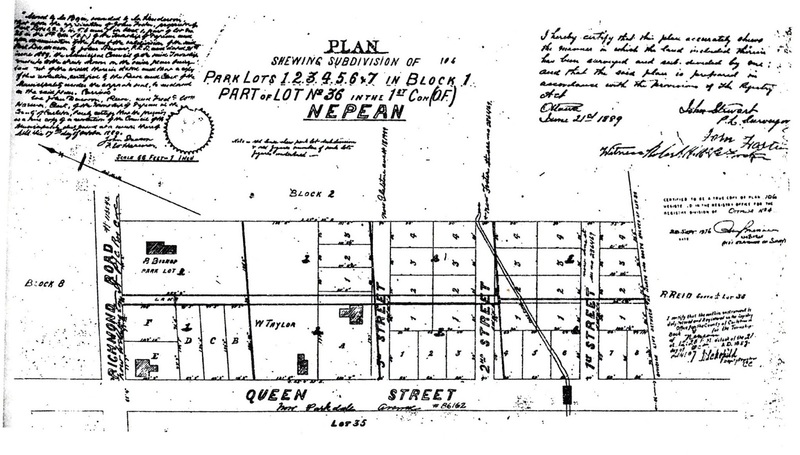 So prior to 1919, there were actually small pocket subdivisions in the area that fell in Nepean (so for instance the streets running off Carleton Avenue between Scott and Wellington, and the aforementioned Mayfair and Piccadilly streets), and been subdivided by real estate investors as early as the late 1890s. So there were some houses there by 1919. Also on the far east side, Holland Avenue was part of an early Hinton subdivision, so a handful of houses stood on Holland Avenue by 1919. 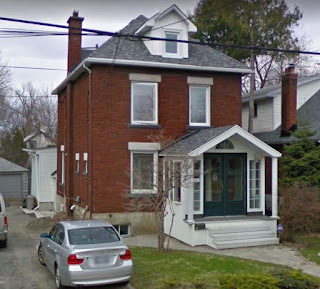 Also, there were three houses fronting Wellington Street dating back to the 1800s that had been part of the Stewart family farm. The main stone house was located where Julian now runs, set a bit back from Wellington on the southeast side. It was tragically demolished in the 1950s. 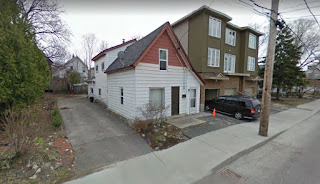 A smaller house built and occupied by one of the Stewart sons was located in what would now be the centre of the roadway on Warren Avenue. It was moved up the street to 41 Warren in 1920 and survived until 2007, when it was torn down (its history likely unbeknownst to its owners) and replaced with a new structure. 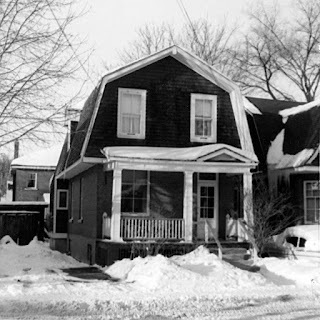 A third Stewart family house thankfully survives, it too was moved, up Granville Avenue from close to Wellington up to where it now stands at 32 Granville. 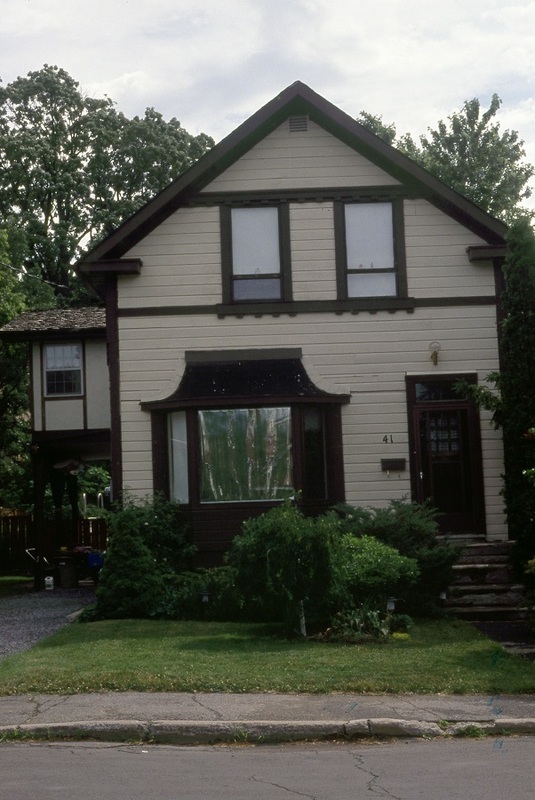 Stewart family home, circa 1991. Moved up Warren in 1920 to 41 Warren. As well there were three houses at the corner of Holland and Wellington on lots which had been sold years earlier by the Ottawa Land Association. 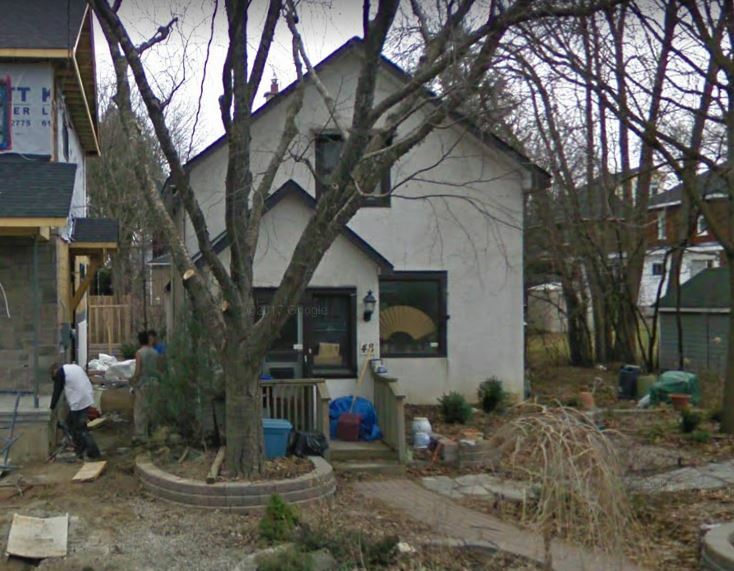 All three are gone, though one exterior wall of the old 136 Holland still stands as part of a new double that was built in 2014, no doubt a requirement to get around zoning or variances. And the last exception is the E.P. Connors House at 166 Huron Avenue, which was built in 1915, and stands remains today as one of the few heritage homes in Kitchissippi. The second photo of it below is particularly cool as it has been caught during that brief period between 1915-1919, before any other houses were built behind it. Huron south of the Connors House was a railway and streetcar parking/repair yard for many years; you can see an old rail car parked up the street from it. parked further south down Huron in the rail yards. Okay, with the exceptions out of the way, here are the THIRTEEN original 1919-built Wellington Village houses still standing today. Note there is no particular order to these photos, and the information provided is the best that can be culled from some fairly patchy historical records. In some cases I've had to say "as early as 1919", its possible that some of these were actually not started until very early 1920, though all were completed by summer of 1920, so if they are not actually 1919 houses, they were extremely close! Lot purchased by James D. Abercrombie at the auction for $375. 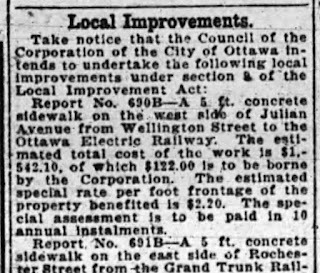 Built thanks to the Ottawa Housing Commission project established earlier in 1919 to help encourage more house construction in Ottawa during the shortage. 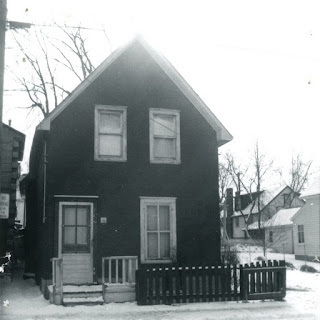 (Several of the houses profiled in this article were built with funding courtesy of the OHC). 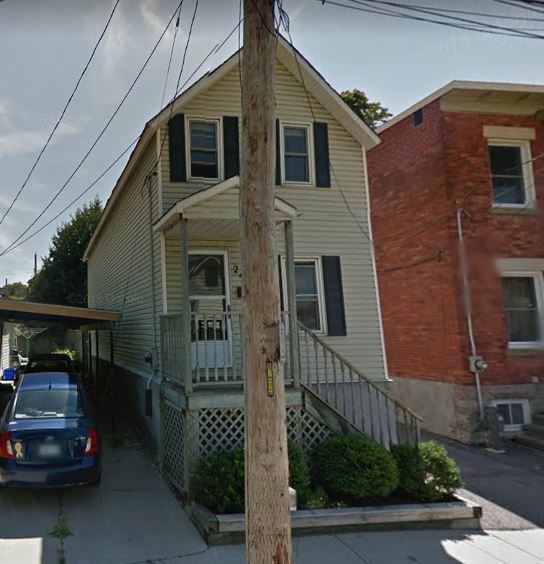 The Commission would sign an agreement with their client, whereby the property owner would transfer over ownership of the lot to the OHC, as part of the agreement to take out a loan of typically $4,000 from the OHC towards construction of the house. The OHC would provide what was then very generous lending rates of 5% interest per year for 20 years. The OHC was a great idea, but somehow never made a significant impact beyond the early 1920s, and by the end of the 1930s, it ceased to exist. The Abercrombie agreement was signed November 3, 1919, so definitely by November construction had began, and it is further possible (as I've seen often) that back in this era, agreements would be made, property or money transferred, and work begun well before the actual transactions were registered officially. So sometimes the registered dates cannot be 100% trusted. 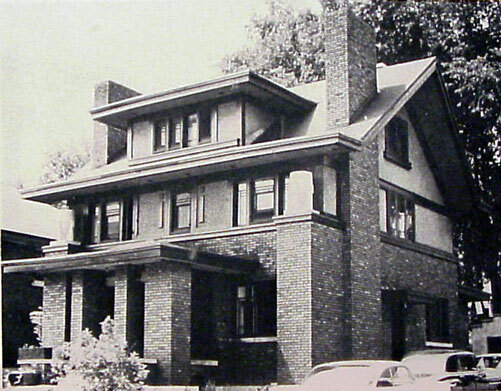 Regardless, the Abercrombie home was started in 1919, and completed by early 1920. After completion, it actually remained in the Abercrombie family until 2002. James Abercrombie at the time was a civil servant, a clerk with the annuities branch of the Post Office Department. November 3rd, 1919, the date he signed the agreement, was incidentally his 30th birthday. Lot purchased by the Ottawa Housing Commission directly, at the auction for $425. 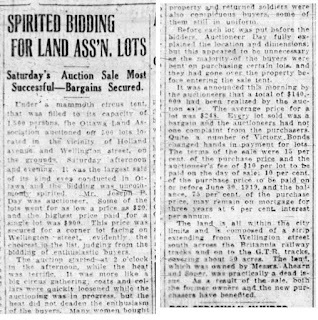 Oddly, it was one of just two lots the OHC purchased at the auction. 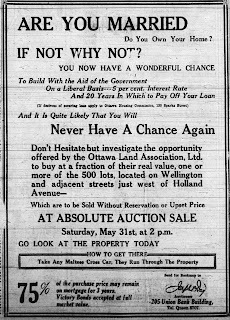 Along with providing loans to encourage home building, the OHC would have houses built themselves, and sell them for a reasonable price, typically to veterans. 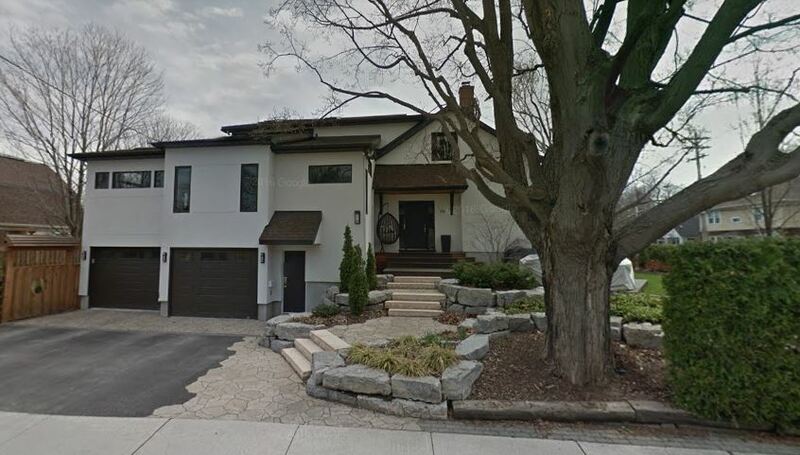 100 Byron Avenue appears to have fallen in this category. William E.C. MacKintosh was the first occupant of the house, a 23-year old Scottish-born vet fresh from WWI, and his wife Evelyn, along with their newborn son. The MacKintoshes only remained in the home about a year. 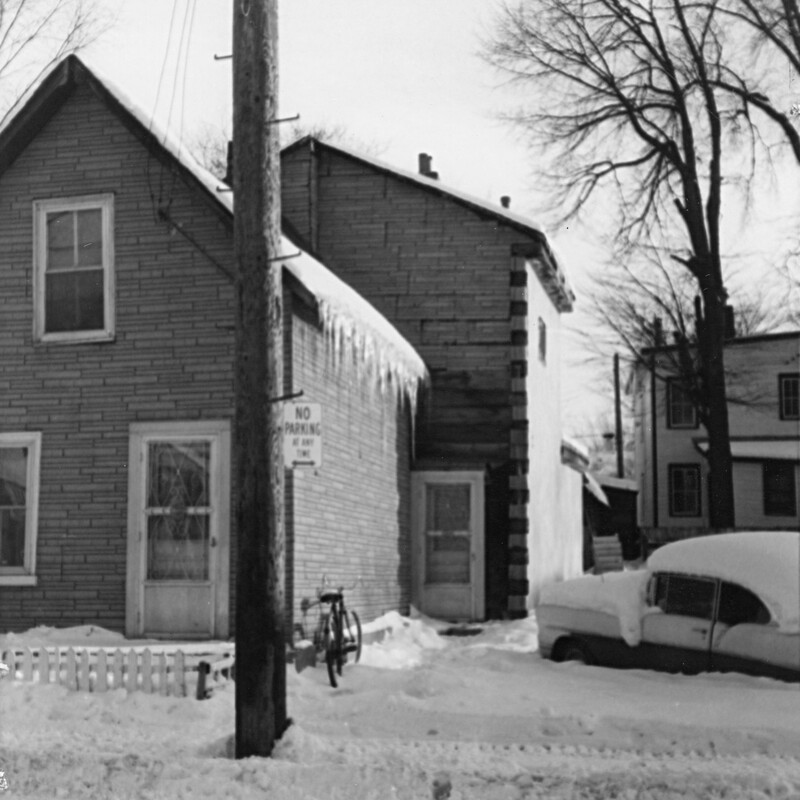 The house actually started off as 1-storey brick home. The second floor with its very unique architecture was added in 1932 by its occupant Frederick Llewellyn Price. Lot purchased at the auction by Edward J. Rainboth as part of a group of 9 random lots, for $1325 (average of $147 each). Rainboth was one of Ottawa's most accomplished Engineers in the late 19th/early 20th century. He was a Provincial Land Surveyor, who helped plan out many of Kitchissippi's early subdivisions, but also worked for years out west, and is attributed to laying out almost all of the original subdivisions in Saskatchewan and elsewhere in the north and west. He was also involved with the OLA, and seemingly purchased the lots for investment purposes. 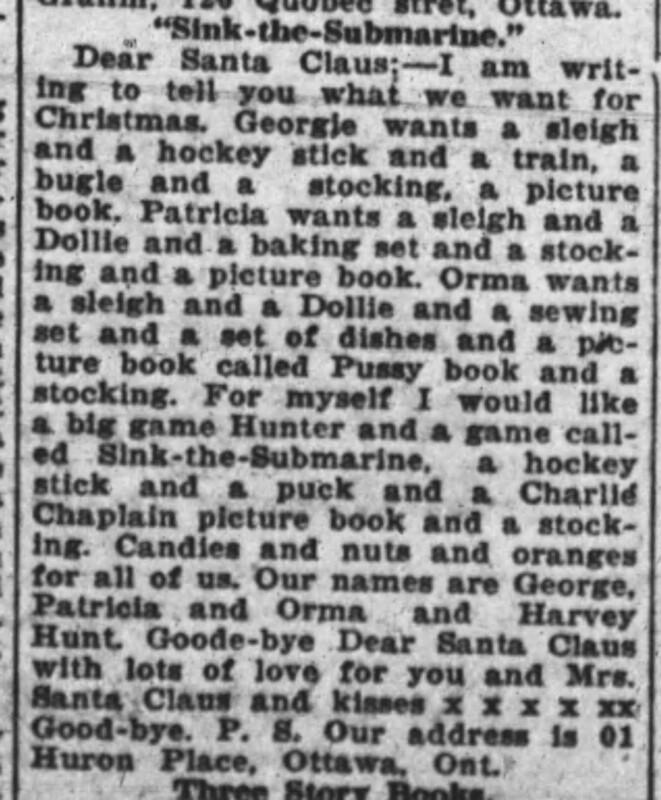 He quickly resold most of them, including this lot, on November 14th, 1919, for $405 to Agnes Blais, wife of Alex Blais. 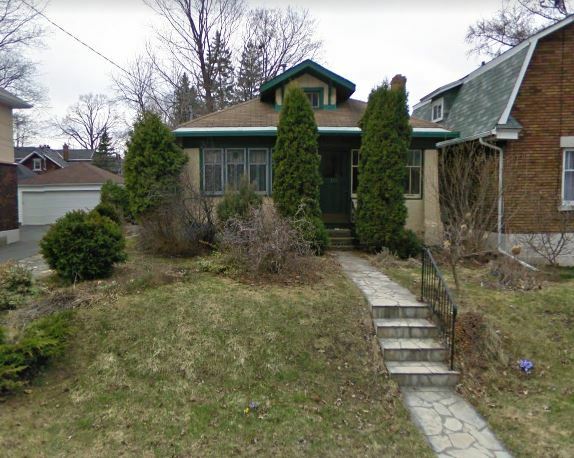 The pair were in their 60s, and according to the 1921 Census, Alex was a deaf-mute who did not work, but received an income (likely a form of social assistance). Blais built the small, simple 4-room wood-frame house for he and his wife. 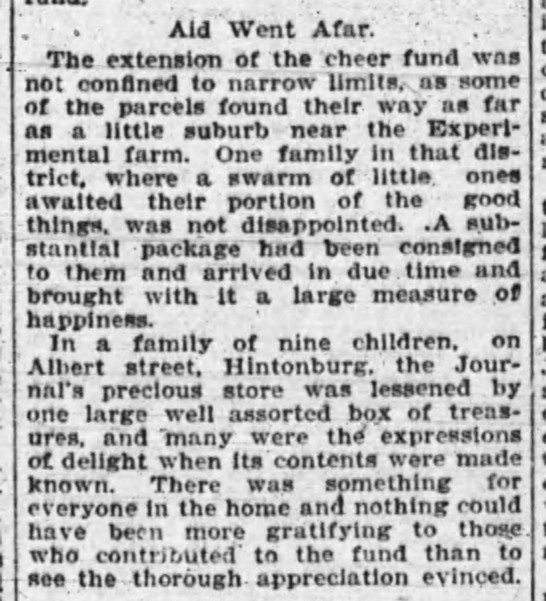 The couple had raised 10 or 11 children (according to Ancestry), but the youngest was 20 at the time, so this was likely their retirement home once all the kids had moved out from their previous house. The house was originally much smaller, and was expanded on at least two occasions, including within the last ten years. It was originally wood-framed, the brick finish was not added until the 1930s or 40s. The Blais house would have been quite isolated in the thickly wooded orchard that once made up part of the Stewart farm. 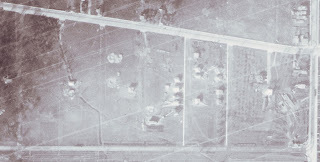 The aerial photo below from the fall of 1920 shows just how heavily treed most of Wellington Village was (south of Byron) at the time, and the immense amount of work that would have been required to simply clear most of the lots for building. would eventually be built in the most thickly-wooded area. see the GTR line going overtop of Holland Avenue. Lot purchased at the auction by William C. Graham for $500. Graham was a 57-year old auditor and chief clerk with the accounts branch of the Department of the Interior. Graham took a loan from the Ottawa Housing Commission at the end of August 1919, and had the house built for himself and his wife Mary Jane that fall. The couple did not have children. Mary Jane died in 1933, and William sold the house a few months later. Impressively, he lived to the age of 97, passing away in 1959. The house appears to be more or less unchanged since 1919, other than the two-storey sunroom added on at some point in time. 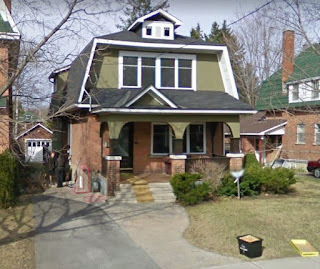 Next door to 26 Harmer Avenue is 30 Harmer, which was also built in 1919, and was likely one of the first two houses that were started in the summer of 1919. The lot was sold at auction to Hugh Michael Graham (no relation to William C. Graham of 26 Harmer above). Hugh got a far better deal for his lot, paying just $200 as opposed to the $500 that William paid. 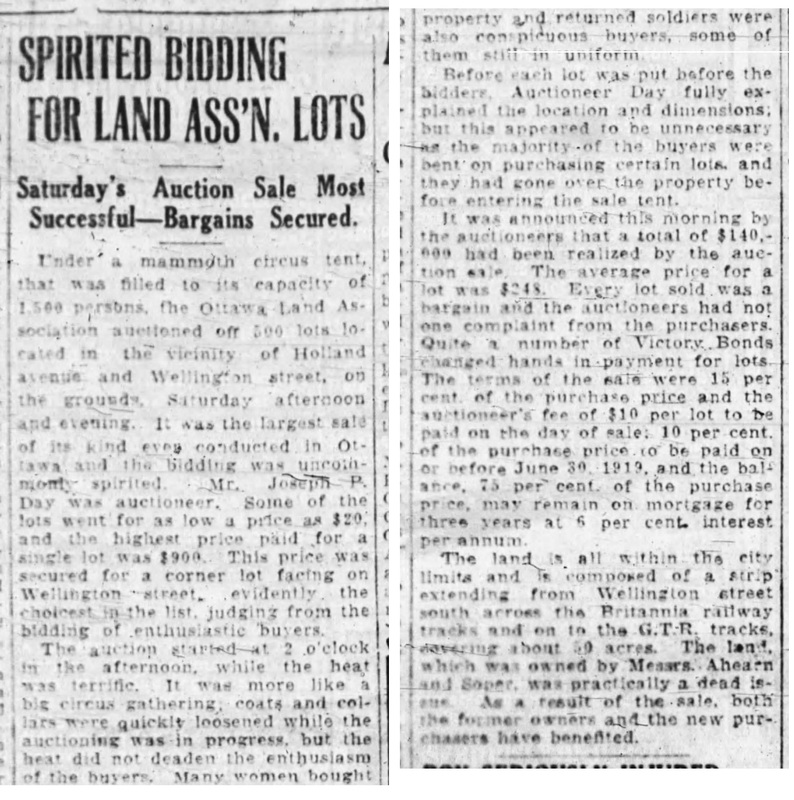 This lot sale was the first one registered by the Ottawa Land Association at the registry office, and Hugh's agreement with the Ottawa Housing Commission was signed off on July 25th, 1919. Hugh Graham was a 35-year old accountant, a senior clerk with the Department of Indian Affairs. He was married with two young sons (aged 3 and 1). Oddly, the Grahams sold the house just three years later. 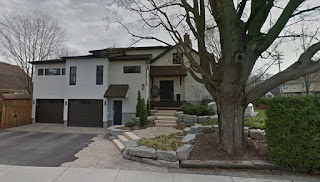 During those three years, records indicate the Grahams had two more children, and would have three more soon after, so it seems the busy couple simply may have outgrown the little 1.5 storey house quicker than anticipated. 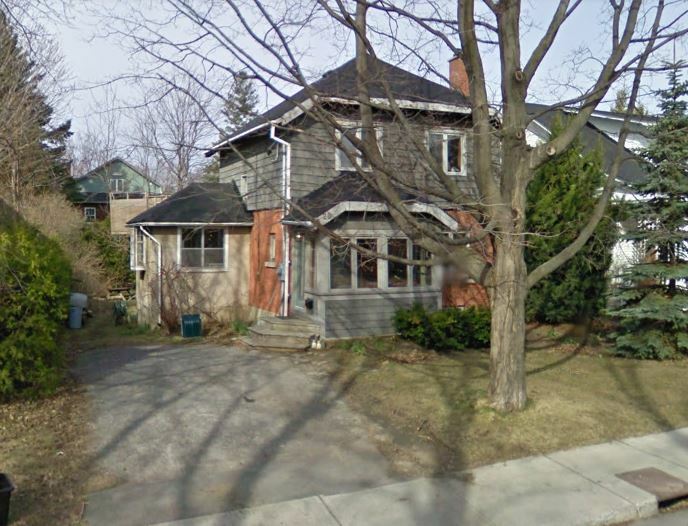 From a street view, you wouldn't think 30 Harmer was an original 1919 house, and potentially even the first. It has clearly been added to over time, and I think even the front has been added to, the brickwork does not appear to match the side. Lot was purchased at auction by Edward Outhet, 29-year old engraver with the American Bank Note Company. The sale price was $600. 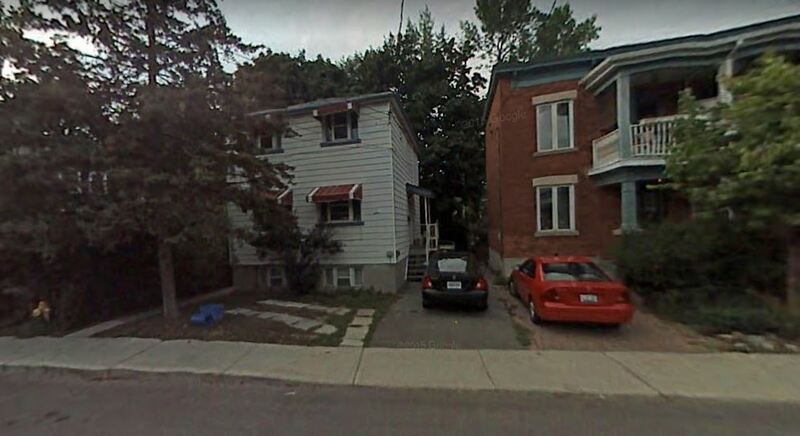 Outhet and his wife Catherine Helena had their first and only child Roy born August 7th; two weeks later on August 20th, they signed the agreement with the Ottawa Housing Commission towards construction of the house. It likely was completed later in 1919. 11 Julian was built in the shadows behind the 1830s stone Stewart farmhouse, where Wilhelmina (Stewart) Sparks, one of the daughters, still resided. It must have been a bit surreal for her to watch houses begin to spring up in what used to be her family's garden and farm. The house was originally only wood-framed, but was bricked sometime in the 1930s or 1940s. Next door to 11 Julian is 15 Julian. This lot also sold for $600 at auction to Florence Harrington, wife of Robert W. Harrington. In fact the Harringtons purchased the adjoining lot as well (where 19 Julian now stands). 15 Julian was built in the fall of 1919, perhaps by Harrington himself, who was a postman with the federal Post Office Department. He was a veteran of WWI, had come home, married his wife Florence in 1918, and the couple had their first and only child right around the time the house was built. 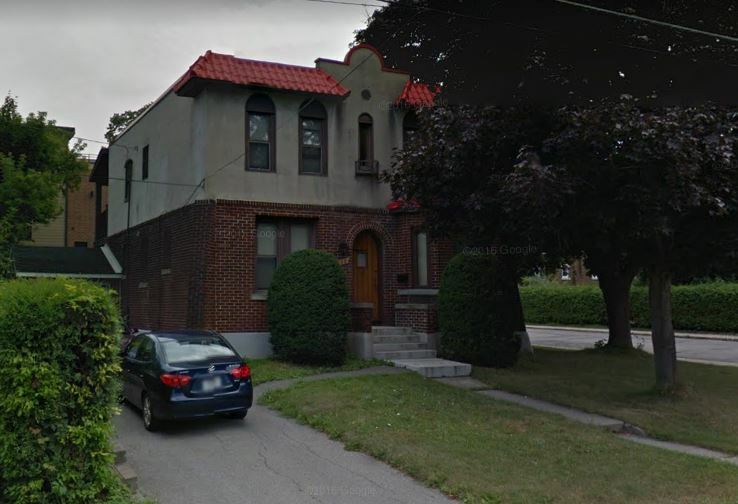 In 1923, Harrington either built or had built 19 Julian Avenue, and the couple sold 15 Julian and moved into the new house. 15 Julian was also not bricked originally, the brick came later on, and as you can see in the photo, it has been expanded on significantly, most recently between 2002-2005 when the large southern addition was put on (which I think looks great. 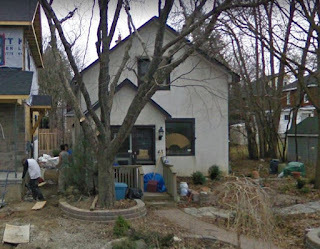 I think this houses like this should be the model for growing living space and maximizing lot size, not tearing it down and putting up an enormous semi-detached double). The lot was sold at the auction to Joseph Hughes for $500. Hughes was the first person in Wellington Village, and one of the first in all of Ottawa in fact to sign up with the Ottawa Housing Commission, as he signed his paperwork on July 17th, 1919. The house was likely completed by that fall. Hughes was also one of the youngest buyers at the auction. He was just 25 years old and a clerk with the freight department of the Canadian Pacific Railroad. He and his young wife Rose had married in April of 1916, just weeks before Joseph went off to fight in WWI. 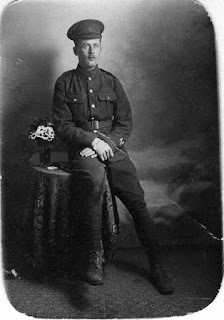 He was wounded in battle in January of 1917, but made it home. He was described by the Journal in 1917 as a "man well known in Ottawa as a singer". The Hughes remained staples on Julian for life, raising their two children there. Rose passed away in October of 1973, and Joseph, after 55 years in the home, sold it a few months later in 1974. 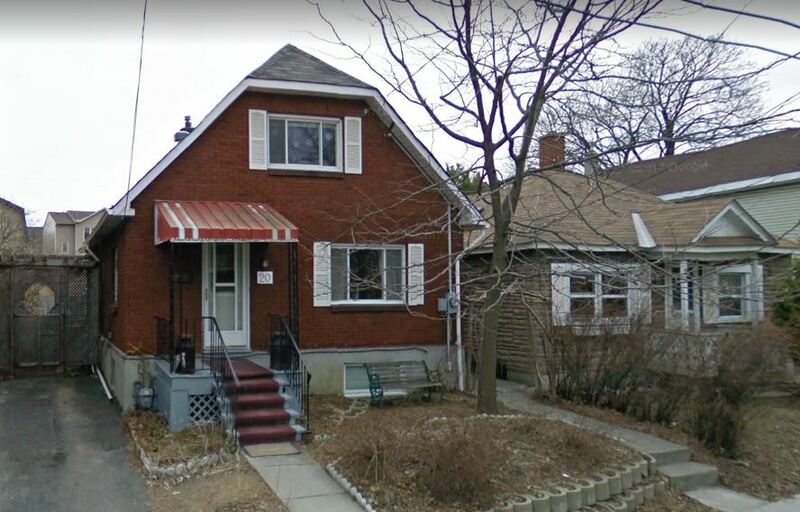 This house appears to have had a rear addition put on at some point, and the brick was not added until the 1930s, but generally it probably is more or less unchanged from how a young Joseph Hughes had built it way back in 1919. The lot was sold at the auction to Henry Nevins for $500. Nevins was a 43-year old messenger with the Canadian Pacific Express Company. He and his wife Mary had three young children, all under the age of four. The approximate date construction started on the house is difficult to determine, as Nevins did not take out a mortgage for its construction, nor did he deal with the Ottawa Housing Commission. But certainly the house was complete and the Nevins family resident by early 1920. Like several of the other early houses on Julian, it too was not bricked until years later. The Nevins sold the house in 1922 for $5,500, and they later resided nearby on Byron Avenue for many years. This lot was sold to Samuel Crooks at auction for $500. 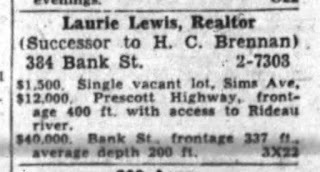 Crooks took out a mortgage for $3,500 in February of 1920 towards construction of the house, though there is evidence construction began much earlier than that. At the time, Sam Crooks was 43, and he and his wife Edith had three children aged 5 to 11. 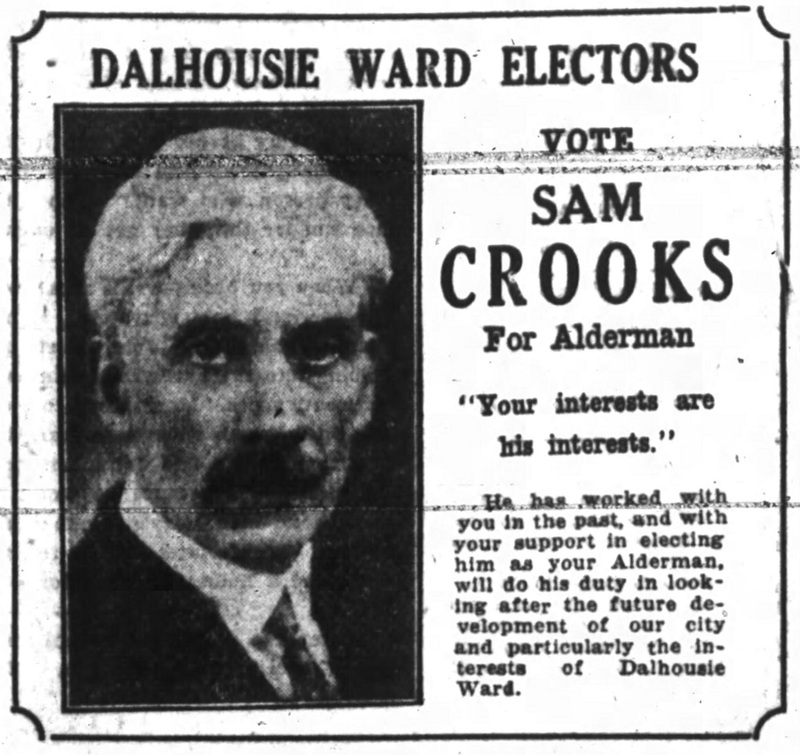 Sam Crooks was one of Ottawa's most well-known citizens during the 30's and 40's, and certainly is one of Wellington Village's most prominent of its history. He was born in Ireland, but came to Ottawa as a child. As a young adult he got into the manufacturing business, and opened a successful factory and foundry in the west end, which he oversaw for nearly 40 years. 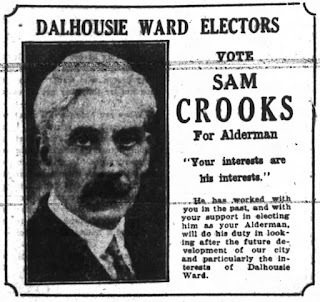 After moving into the Wellington Village area, he became interested in local politics, and ran for alderman in the ward, a position he held from 1924 to 1931 (first as Dalhousie Ward, then as of 1930 the area fell into the new Elmdale Ward). One of his key projects was to oversee the establishment of the Cave Creek drainage/sewer system in the late 20s. He was on the board of the Central Canada Exhibition for many years (President from 1931-1933, and a life director afterwards). In November of 1931, he was appointed Sheriff for the County of Carleton (ironic considering his surname), a position he held until December 1945 (in the role, he worked closely with the court system in eastern Ontario, and also oversaw the Carleton County jail on Nicholas Street). The Crooks family remained in 32 Julian for the remainder of their lives. Sam died at home in 1959 at age 84, and his widow Edith remained until she passed away in 1967. The house appears to be more or less unaltered since it was completed in 1920. 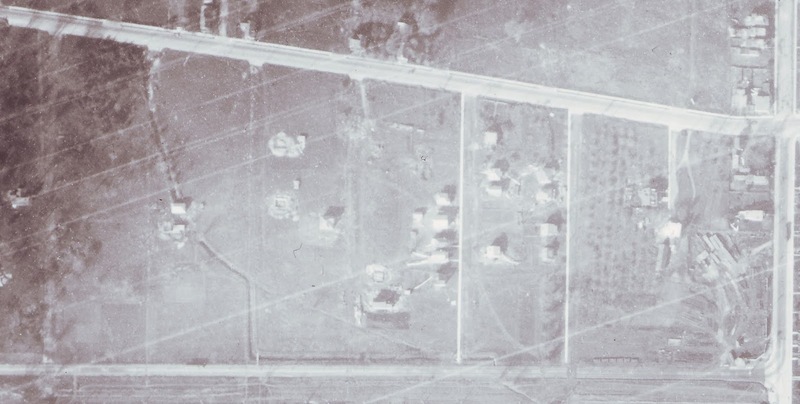 The aerial photo below is from the fall of 1920, and shows Julian (and Harmer) having the first sidewalks. 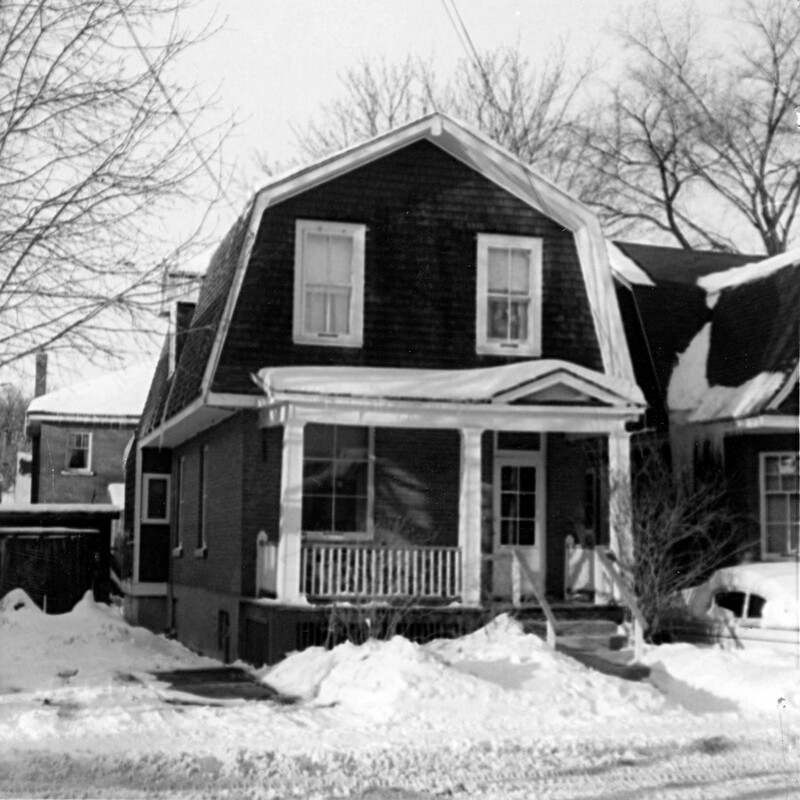 Julian was the first area to build up, and the Stewart stone farmhouse is still there, close to Wellington Street. through Hampton and Clarendon Streets. This lot was sold to Victor Sorensen at the auction for $150. Sorensen built the house himself for his wife Marie and their planned family (they had one daughter Alice, born a little over year later). At first the house was just 1.5 stories and wood-frame, but Sorensen gradually added to it. The second level and brickwork came likely in 1923, just prior to a tragic traffic accident which killed Victor. Sorensen was 31 years old in 1919 and a native of Denmark. In his youth, he had been a sailor and had sailed around the world a number of times, and at one time had hunted whales in the Antarctic. He came to Ottawa in his twenties, and gained long-term employment as superintendent of the awning department of Grant, Holden and Graham. He was an avid cyclist, competing in tournaments elsewhere in Canada, and was president of the Diamond Bicycle Club in Ottawa. 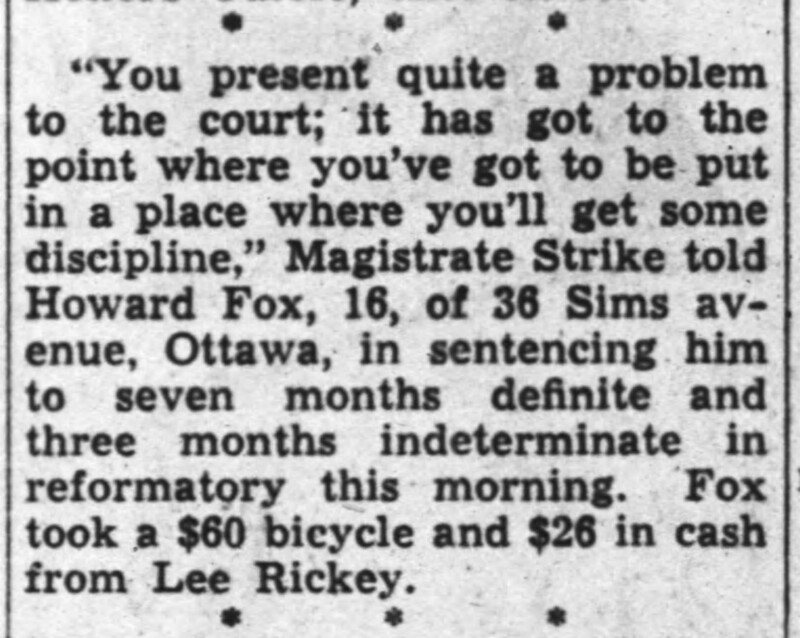 He raced bicycles in his youth, but had become more known as a "restraining influence on his fellow club members who were inclined to take risks on the city streets", said the Journal, and he had "been foremost in advocating the compulsory use of lights on bicycles in Ottawa as a preventative measure against accidents." 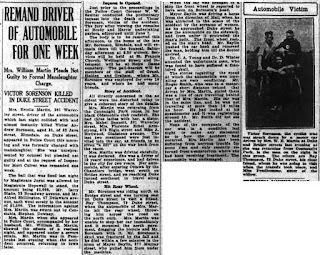 It was thus all the more shocking that Victor was killed by a slow-moving car in LeBreton Flats on the evening of May 30th, 1923. 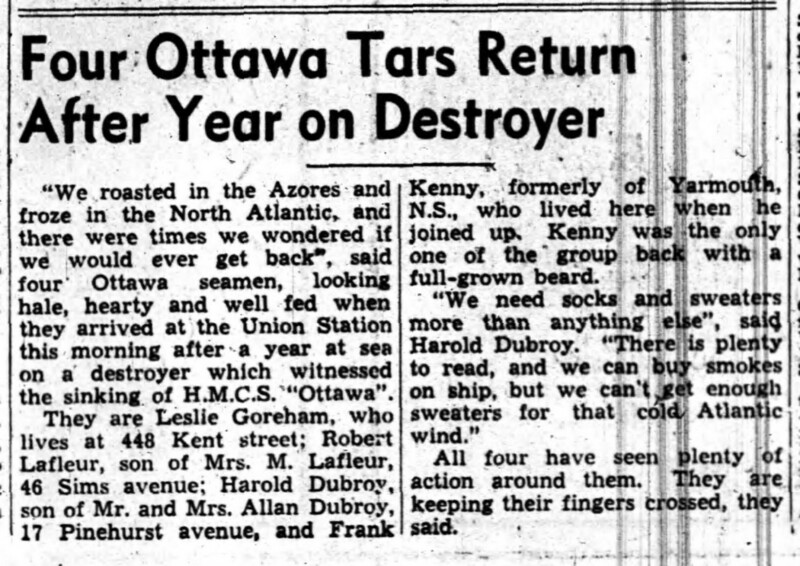 The story was front page news, during the early days of automobiles on the streets of Ottawa. The news account of his death included the final chilling paragraph: "Last Sunday (three days before his death), Mr. Sorenson was walking with his wife. A sparrow alighted on his shoulder. He then had a premonition that this was an ill omen, and told Mrs. Sorenson, who remarked that, if anything fatal should happen to either, she hoped her husband would be spared." The driver of the vehicle was found to be without blame, as the inquest held a week later showed her car was moving only 8-10 miles per hour. Estelle Martin was distraught in court over what had happened, still at a loss as to how the accident could possibly have occurred.The jury ruled it to be accidental death. 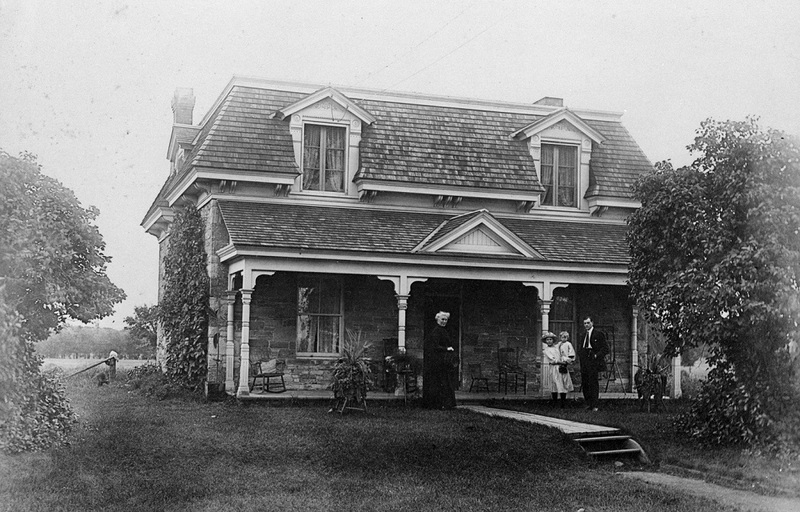 Maria Sorensen remarried a few years later, and sold the house in 1928. It still stands today in likely a very similar state as how it was built by Victor Sorensen just less than 100 years ago. Lot was acquired by 41-year old George Hobbs at the auction for $275. Hobbs and his wife Annie had two daughters, aged 11 and 4. George was employed as a blacksmith. Hobbs built the house in 1919. It was originally just wood-framed, the brick came later, likely in the mid-late 1920s. 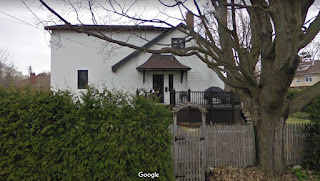 This well-maintained and gorgeous house has looked across at the Elmdale School playground since Elmdale opened in 1929. 87 Java actually survived a fairly minor fire in March of 1940. News reports tell of the firefighters being delayed, having just finished fighting a large blaze downtown. The trucks attempted to head to Java Street, but during the downtown fire a pump at the Slater Street pumping station had burst, filling the building and the street with water, blocking access west near LeBreton Flats. By the time firefighters arrived to 87 Java, the four members of the Franklin family were clinging to the roof of the front verandah. 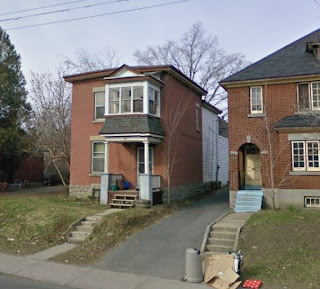 This lot was acquired at the auction directly by the Ottawa Housing Commission. The sale price for the lot was $300. The OHC entered an agreement sometime soon after with Frederick James Petry, a 25-year old clerk with the purchasing branch of the Department of Marine and Fisheries. He and his wife Mabel had two young children at the time. Petry had the two-storey home built that fall, and it too was not initially bricked, that came afterwards. 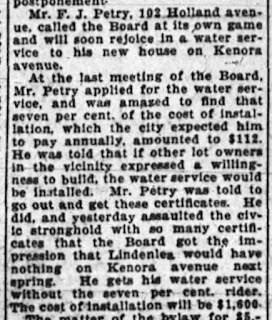 Petry worked hard to see water service come to Kenora Street in 1919. He petitioned the Board of Control to lay water mains on Kenora, since most other streets had it. In fact Kenora had even been given sewers, but was skipped for water service due to a lack of construction activity. 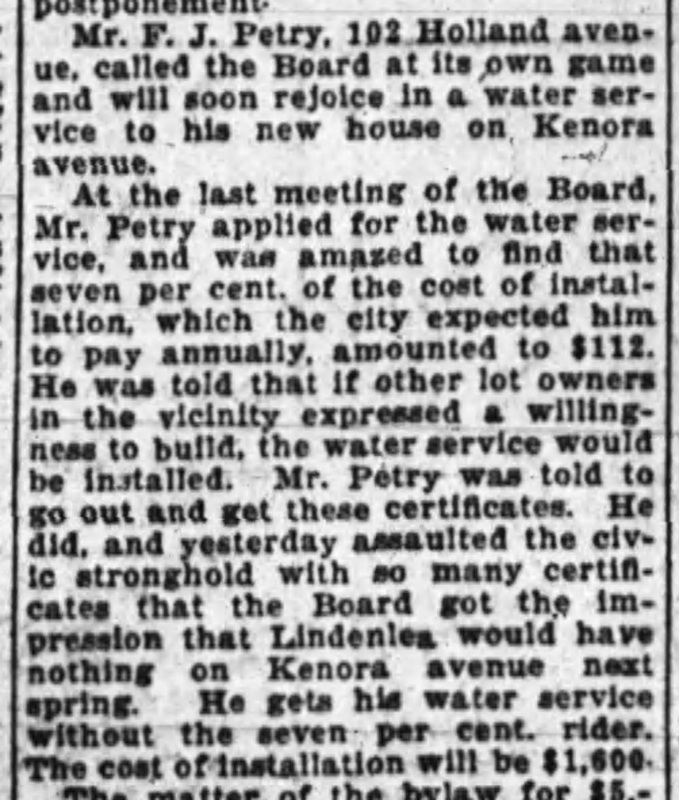 Petry tracked down other lot owners on Kenora and showed the Board that substantial construction was coming, and was successful in his endeavour to have water mains laid on Kenora right away. 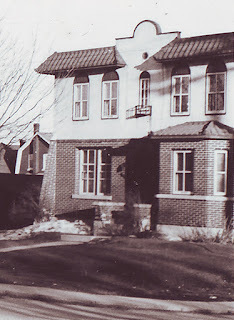 Joseph Schryburt's house, located where 76 Byron Avenue stands today. It was a small 1-storey, 5 room wood-frame house set back almost to the rear lot line. 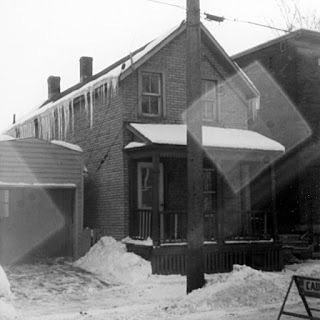 The house did not last long; it was gone by the late 1920s, the lot was surrendered due to unpaid taxes in 1928, and the new semi-detached house built in the early 1930s. 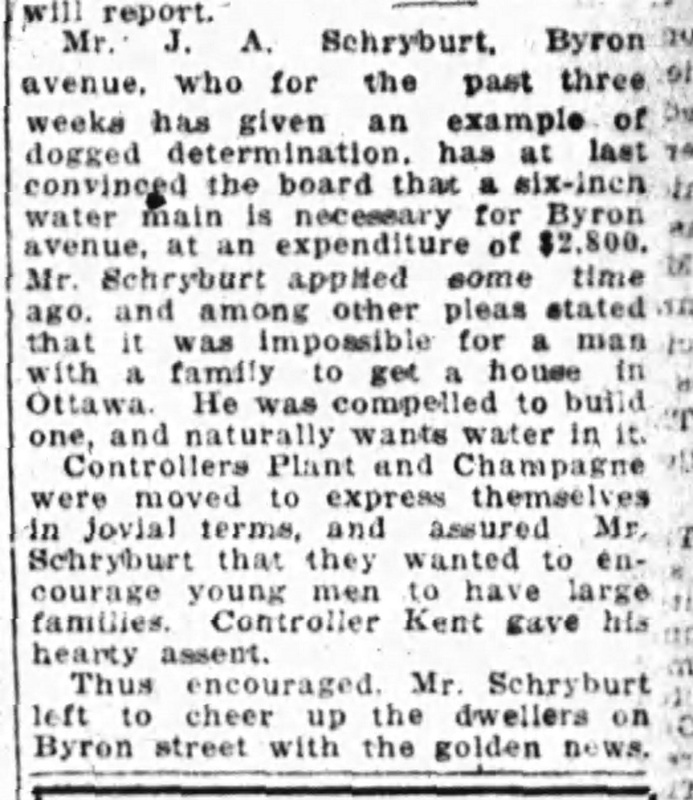 For a time though, Schryburt was a strong advocate for getting infrastructure to the area, battling Ottawa's Board of Control for water mains down Byron Avenue. 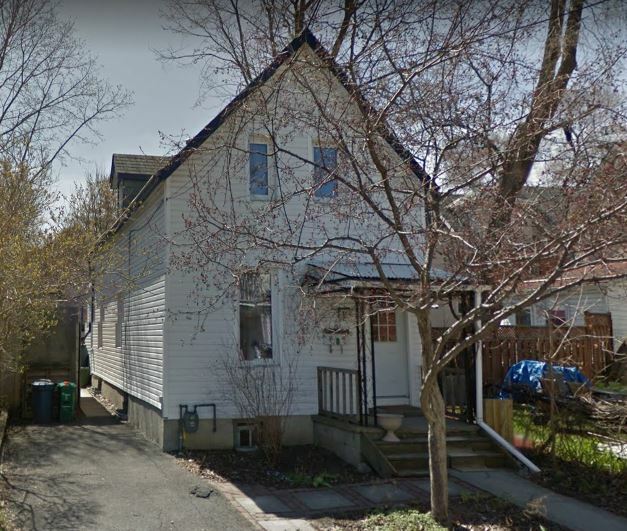 124 Clarendon Avenue: This lot was also part of the batch purchased by Edward J. Rainboth at auction, and was sold to Angelina Larocque, wife of Andrew Larocque, on September 30, 1919, for $400. Andrew was a 34-year old carpenter. The couple had no children. The house was torn down in 2011, and replaced with a large double. It had remained basically unchanged since 1919. 124 Clarendon in 2009, now demolished. 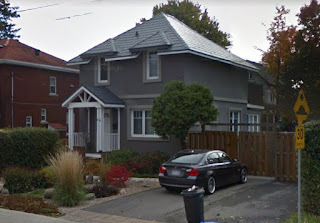 48 Java Street: Built by carpenter Robert Bonsall in 1919 for his family, this house remained virtually the same until it was demolished between 2012 and 2014 and replaced by a monster home. 47 Iona Street: Was originally built by John Balmforth Stott between 1919-1920 as a 1-storey wood-frame house, but was substantially updated later in the 1920s, with a second storey put on and bricked. It was demolished between 2009-2012 and replaced by new house. J. Arthur Davis built a house where 49 Kenora Avenue now stands, by the corner of Clarendon, in 1919. 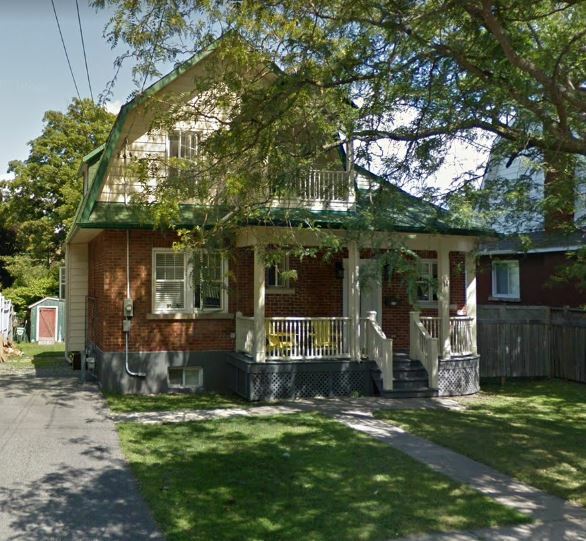 It was a small, 2-room wood home, more of a cottage or likely a shack, one of the simpler new homes built in the Elmdale section (and which absolutely went against the minimum building conditions laid out by the Ottawa Land Association). 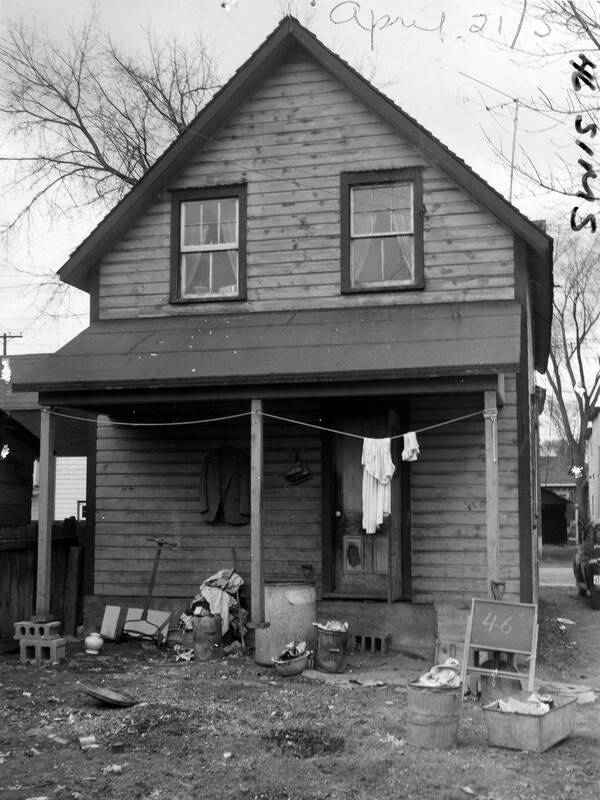 Davis rented the home out to 42-year old millhand John F. Keeler, his wife Clara, and their six young children. By the fall of 1922, the house was gone; either demolished or more likely burned in a fire. The ruins and foundation remained on the corner lot into the 1930s, until the new 49 Kenora was built in its place. So there you have it, a comprehensive snapshot of Wellington Village in 1919, and it's thirteen 1919-built houses still standing 100 years later in 2018. Happy birthday! sheds; blue circles are fire hydrants). Name meaning: The street is named for Gerald Sims, who was a local politician in the 1920s/1930s. 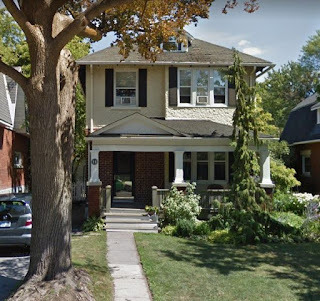 He represented the neighbourhood, much of which was then known as Victoria Ward, as Alderman for three years from 1925 to 1927 (two of those years by acclamation), and was very engaged in the community. His family were early Bytown and Nepean pioneers. A large portion of the Experimental Farm exists today overtop the original Sims family homestead. Gerald's father, Richard Albert Sims, a well-known contractor in the early pre-Confederation days of Ottawa, was born on the homestead. 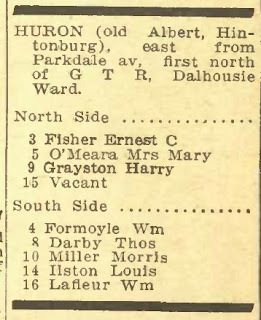 So Sims claimed family heritage in Victoria Ward when he ran to represent the ward beginning in 1922. He was a veteran of WWI, where he acted as assistant director of the War Purchasing Commission, and remained involved with the Department of the Interior until 1925, when he became Ottawa manager of G. H. Wood and Company ("Manufacturers and Distributors in Canada of Sanitary Products"). 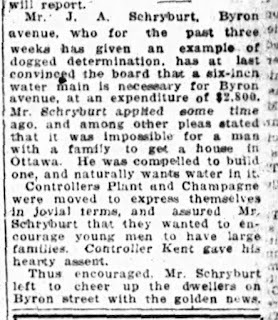 After serving as Alderman for Victoria Ward, he was elected twice to Ottawa's Board of Control (1929-1930). He contributed particularly to the Publicity Commission, Playgrounds Commission and Old Age Pensions committee, as well as a director of the Central Canada Exhibition. He was Controller of the Fire Department in 1929 and in 1930 was Controller of the Waterworks Department. He was also a prominent member of the Knights of Columbus, and Grand Exalted Ruler, B.P.O. Elks for Canada and Newfoundland. Sims never married, and died in the same house he was born in, on Sparks Street at the north-west corner of Bay Street. 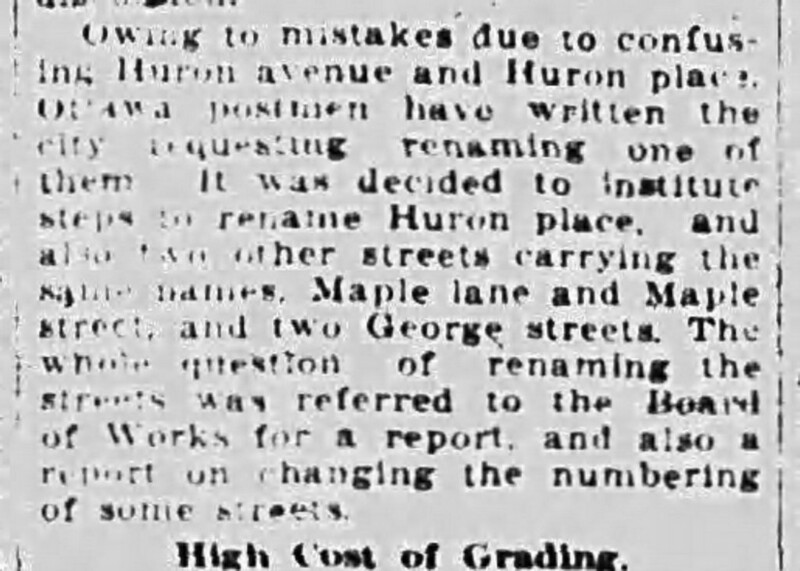 How named: The street was renamed multiple times due to duplicate naming: there were two First streets in Hintonburg, then Albert Street was an obvious duplicate when Hintonburg was annexed to Ottawa, and then in 1919, the Ottawa Land Association opened up their property and established Huron Avenue just a few blocks away from Huron Place. After much confusion for 6-7 years, the street had to be renamed again, which it was in 1926, to Sims Avenue. It is unclear to me how the name Sims was selected. Gerald Sims was Alderman at the time and may have selected the name himself. Or possibly a group of local citizens may have pushed for it. At the same time, a strong case could have been made for Laroche Park to have actually been named for Sims, as arguably Sims was more aggressively involved in its establishment. Perhaps he accepted the street renaming as a consolation prize for allowing Laroche Park to be named for Laroche earlier that year. 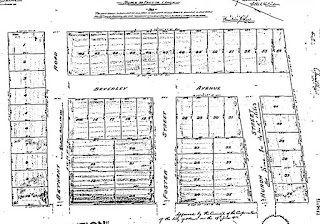 The lots on the south side of Sims had (and still have) different depths, since the street ran east-west parallel to Richmond Road, but Richmond did not run parallel to the borders of old Nepean Township lot 36. Lot 36 was split in half back in the early 1800s, with Robert Reid owning the farm on the south half. Thus lot 4 is only 73 feet deep at the shortest point. The rear lot lines of each of the lots on the south side is the exact centre of Nepean lot 36. Another noticeable feature, shown in the Plan 106 above, is the existence of Cave Creek right by Sims Avenue. The creek was very predominant in the neighbourhood, and was both a nuisance and a convenience, depending on your perspective. I wrote about Cave Creek a few years ago for the Times (https://kitchissippi.com/2016/03/30/cave-creek-ottawa/). 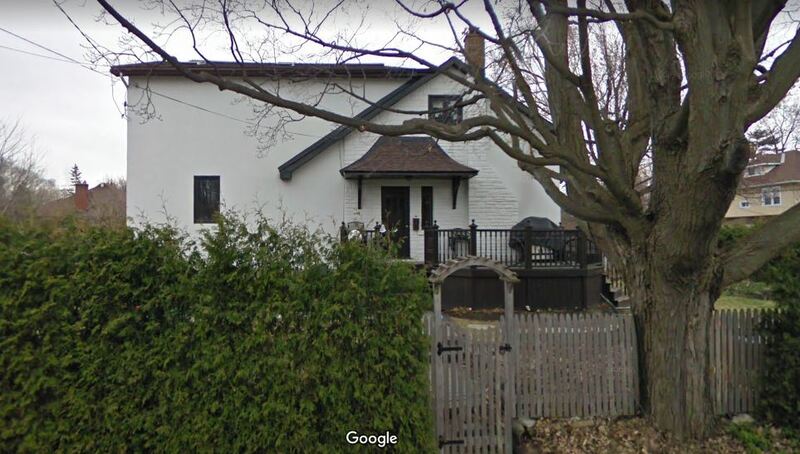 It was a problem because it would overflow significantly each spring as it carried the thaw waters from the farms south of Carling Avenue, and also because it was used as the unofficial sewer system of the neighbourhood long before sewers were installed. However for many it was convenient for that very reason - that it was a handy way to empty outhouses, or obtain water useful for feeding animals or washing purposes. 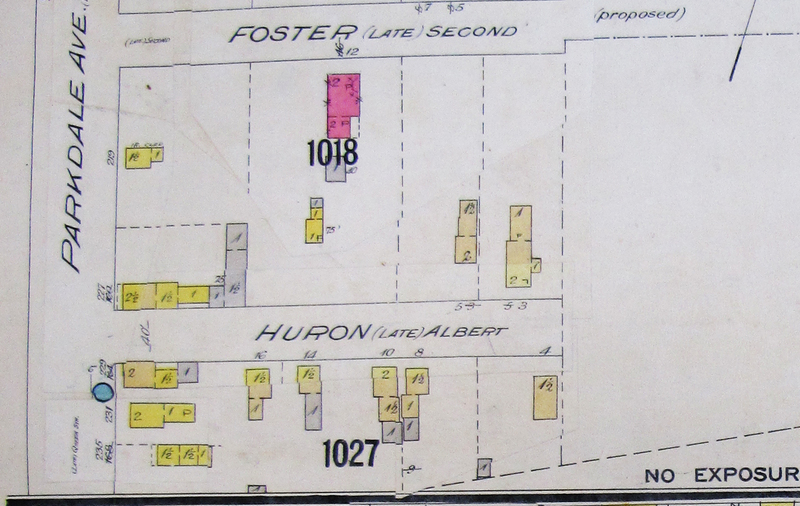 In the 1889 plan, Cave Creek is shown crossing right in front of what is now 477 Parkdale Avenue, and through its property a little, and then continuing north-west, away from Sims. The solid black line on Queen Street (Parkdale) indicates there was actually a small bridge or crossing built over the creek at the time, for the benefit of horse and foot traffic. The first lot on 1st Street (Sims) to sell happened immediately. 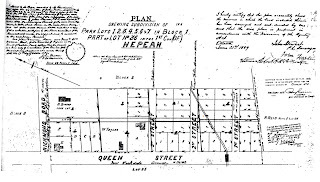 The plan was registered at land registry on October 21st, 1889, and the next day, October 22nd, carpenter Eugene Provencal acquired lot 6 fronting Parkdale Avenue and built 477 Parkdale Avenue, which still stands today (though it has been extensively renovated and added on to, and the brickwork came in the 1920s, but the shell of the house dates all the way back to 1889). Provencal was in his late 50s, born in 1836. Seems extra-impressive to me that we can walk by every day in Hintonburg a home that was built by someone born in 1836. In fact, within that first year between October of 1889 and March of 1890, there were four other houses built on Sims, including on the opposite corner of Parkdale, where 479 Parkdale was constructed by cab driver Adelard Bisson. 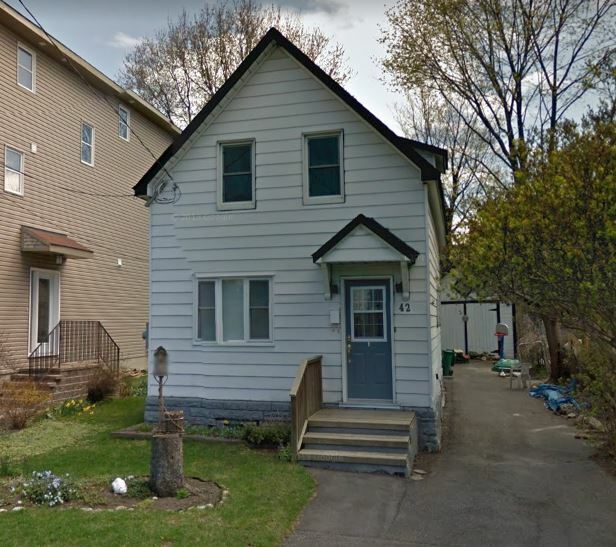 However most important to this story are the houses which actually fronted onto Sims; and all three of these first houses on Sims were built on the south side of the street. 24 Sims was built by 32-year old mill hand Adolphus Carriere; 34 Sims was built by 28-year old mill hand Thomas Derby; and 42 Sims was built by 40-year old stone mason Joseph Pelkicy (which I think should actually be Pelletier, the scattered records from this era aren't always accurate on spelling). 24 Sims (the Carriere house) still stands today, but has undergone a few changes. I found a photo of it from 1967, and included a recent one for comparison. 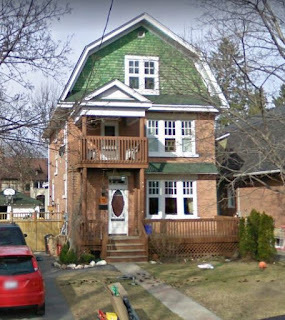 The three interesting points about this house: the upstairs windows are awkwardly non-symmetrical, and it appears always were; the house has clearly been jacked up at some point since 1967; and thirdly, it is impossible to find a photo of the house without the hydro pole blocking a good chunk of the house! 34 Sims (the Derby house) was truly the Derby house. Thomas and his wife Emma remained in the house until his passing in 1942, and his son Eugene was there until his death in 1968. 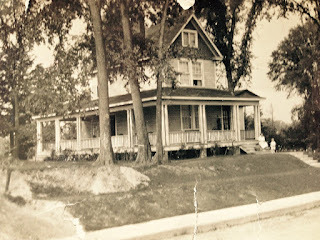 The house was still standing until around 2009, when it was torn down and replaced by a double. As you can see from the below photos from the late-1902s, 1967, 2007 and 2009, it had a very unusual construction, with thee different segments that were added to over time, forming a long narrow home. It is these types of pure-character houses in Hintonburg that hurt a little extra to see demolished when they finally go - just so much history there, in each part of that house. 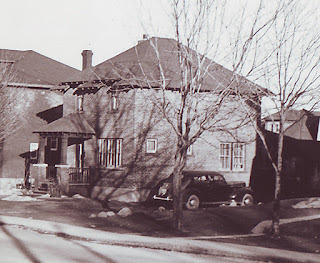 34 Sims Avenue, circa late-1920s. Sims, but the photo captures well 34 Sims. 42 Sims, the Pelkicy house, is of most interest to me personally. Pelkicy (Pelletier) built the house and resided in it briefly with his wife and five children, but he sold it within a year. 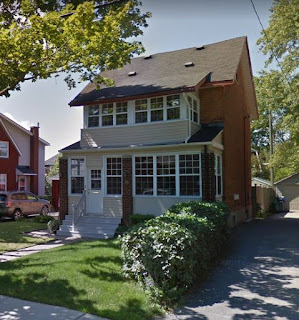 It had a series of tenants and short-term owners/occupants all the way up until the 1930s when the Goodman family moved in and remained for many years (1938-1973), by far its longest occupants. It is a fairly average little house, set back from the street more than just about every house on Sims. However, its importance to me is that this was the first home occupied by my great-grandparents Louis James Allston and Maud Davis, when they first came to Canada in 1913. They married in March of 1914, and were resident of the house immediately afterwards (and maybe even before?). Louis and Maud had both come from the same area of the outskirts of London, England; Louis specifically from West Bergholt, where the Allston name was prominent for hundreds of years. They met on the ship bringing them to Canada, and married in Ottawa within months of arriving. 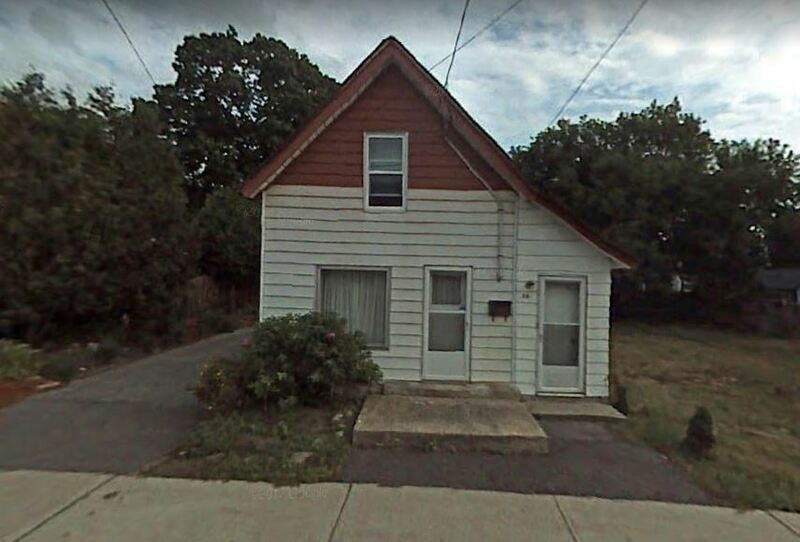 42 Sims was their first home, and it still stands today, which I think is a really cool thing. as "Ilston", this was fixed in the 1915 edition). The next house to be built on Sims was 46 Sims, which came less than a year later, between 1890 and 1891. It was built by wood dealer William Cochrane, who had purchased lot 1 from Pelkicy, including the already-built 42 Sims, and built the second house on the lot next door. 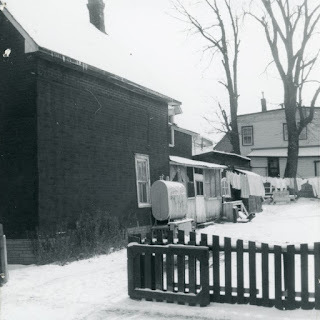 Below are two classic photos of 46 Sims from 1956, when it was photographed as part of the Urban Renewal project for Ottawa of decrepit/eyesore houses. It doesn't look too bad, other than the debris in the backyard (including the hanging ice skates and suit jacket), though if you look closely, that middle porch support doesn't really seem to be doing its job! 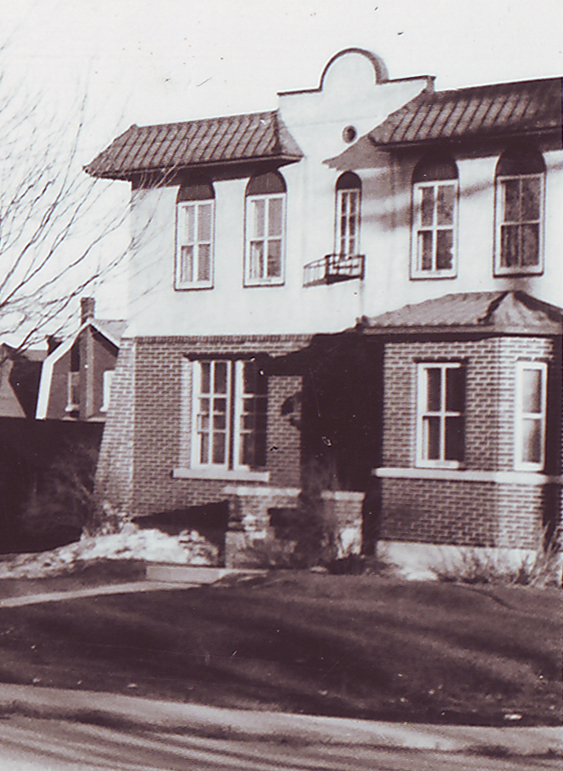 Sims did not see any construction on the north side of the street for the first ten years of its existence. 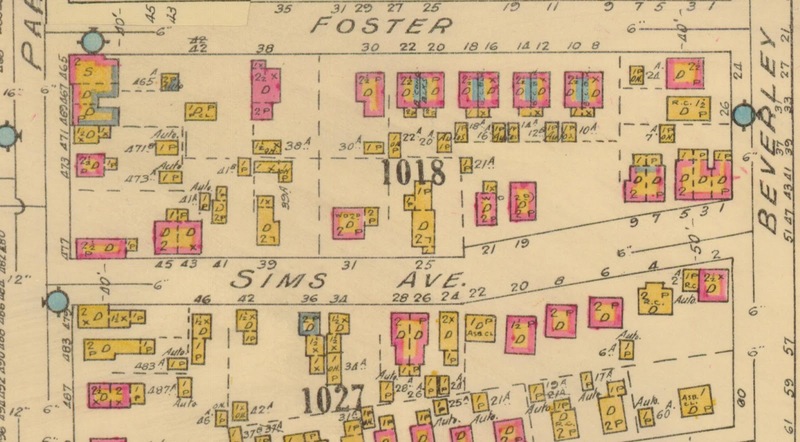 It was in 1901 that a Swedish immigrant named Charles Ernest Fischer built what is today known as 25 Sims. The Fischer family came from Linkoping, Sweden, arriving in Canada in 1900. Ernest and Anna had two children, daughter Linéa (born 1890) and son George (born 1891). 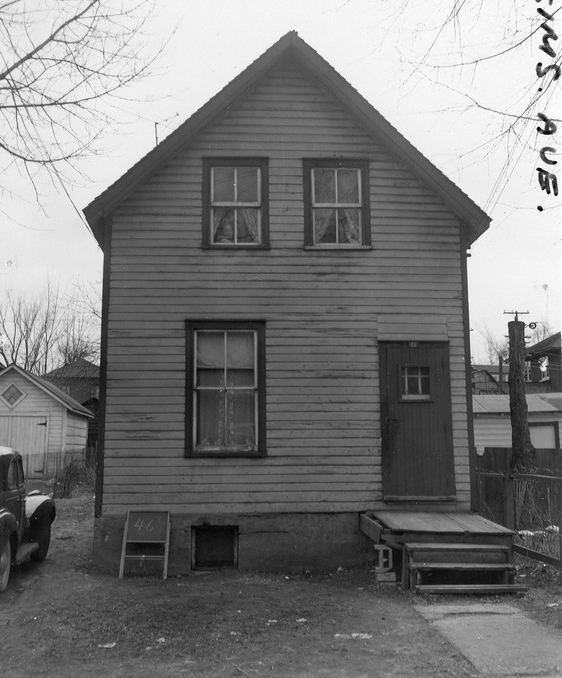 Ernest built the two-storey frame house on the lot, originally with a flat roof of what was known as "felt and gravel". 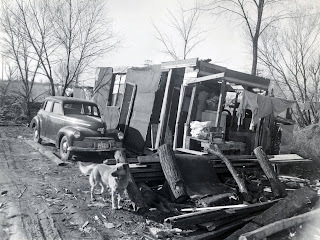 Later a high-pitched tin roof was added. 25 Sims Avenue - The Fischer house. Circa 1915-1920. A profile on the Fischer family in Newswest in 1979 noted that Ernest insured the house in 1901 for $300 and its contents for $100. That was the value of the house and contents, not the premium! The premium paid was $6 for three years. By 1925, the house was insured for $1,500, with a premium of $14 for three years. 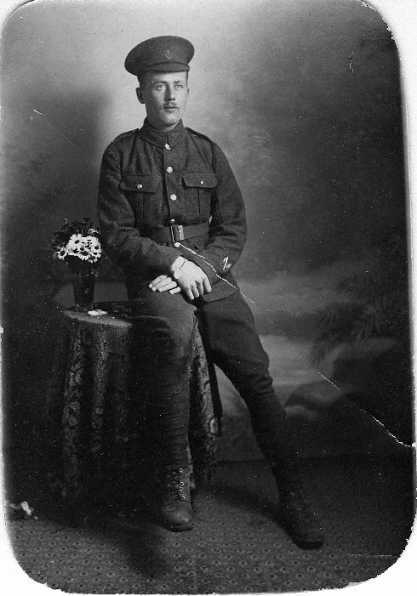 Ernest was a cabinet maker, who first gained employment at the Oliver & Sons factory on Gladstone near Preston, and later worked for Booth's mill. His income in 1909 was $528.35. at right, long-time border with the Fischer family. 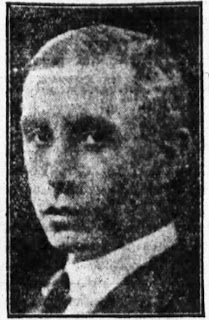 Sadly, the Fischers lost son George in 1902, and Mom Anna passed away fairly young as well, in 1928. 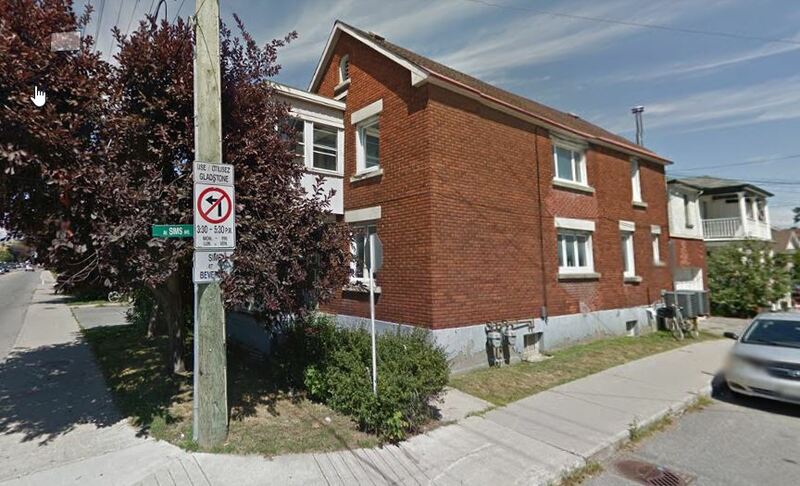 Daughter Linéa Fischer resided and remained active in Hintonburg her entire life, and passed away in 1976. She was a long-time Sunday School teacher at Parkdale United Church. She kept detailed notes of her family's finances in their early years in Canada, and also kept a detailed diary for most of her life. Newswest writer Peter Ford wrote an article on the Fischers in 1979, and mentioned that he had acquired the photos and papers of the Fischer family, which he used in his detailed article in Newswest. I wonder if those vintage items still exist? also maintained detailed diaries during her lifetime. The next house completed on Sims was in 1902, when carpenter James O'Meara built 31 Sims Avenue. This house would see its share of tragedy during its brief few years of existence. O'Meara himself passed away just two years after its completion. 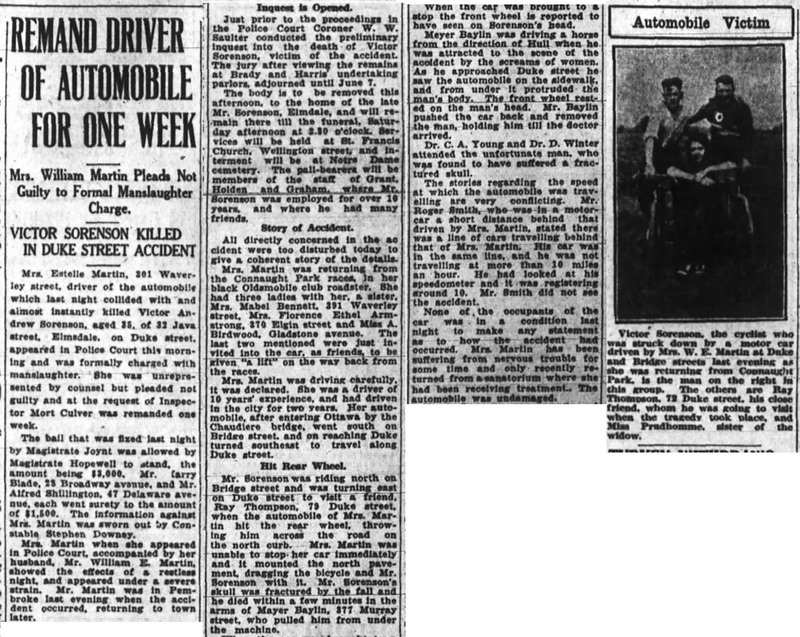 At midnight on Saturday November 12th, 1904, the 34-year old O'Meara was struck and killed by a streetcar while lying on the track at the corner of Wellington and Parkdale. At first it was believed the streetcar caused his death, but the inquest held two days later raised doubts as to whether all of his injuries were sustained by the streetcar, or whether foul play had been involved prior to his lying on the tracks. 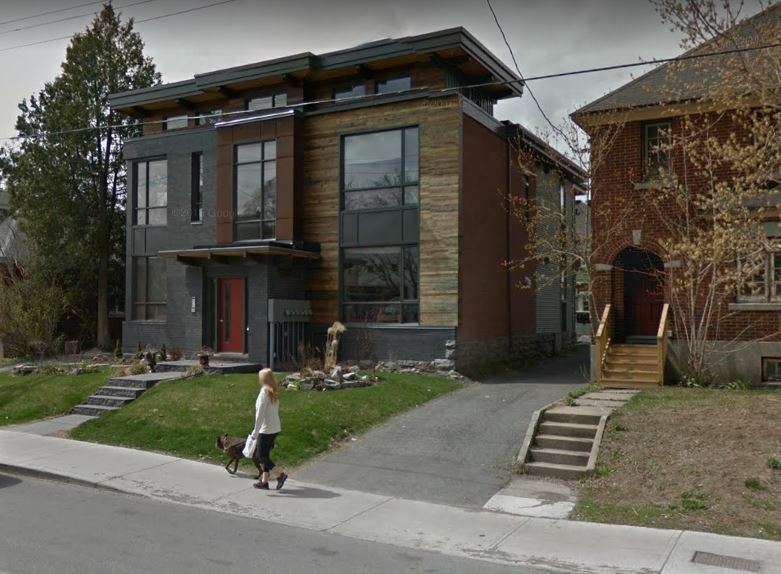 He had been seen at a local Hintonburg tavern earlier that evening, and had later been seen lying drunk on the front steps of a house at Richmond Road and Fairmont, where a stranger helped him up, and walked with him as far as Parkdale. That individual claimed O'Meara did not want to go home, and instead kept walking west. The inquest revealed inconsistencies in how much money he had in his pocket versus what he had received in wages earlier that day, and other witnesses claimed to have seen him lying down in front of another house, looking more injured than drunk. 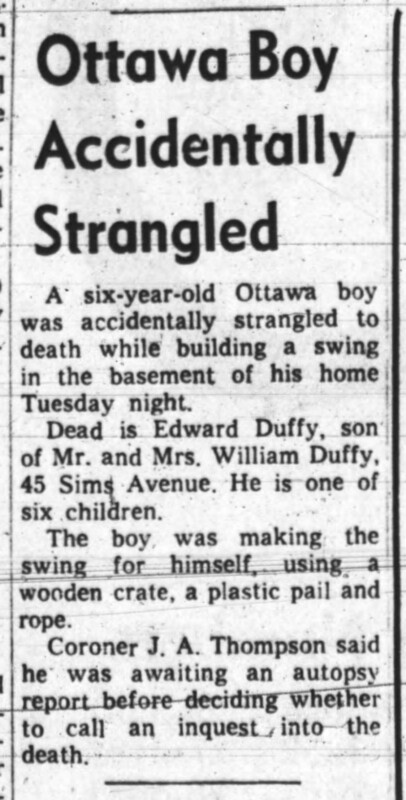 The entire story was quite bizarre, and no other mention was made of it following the inquest, where the jury simply stated that it was not definite that his death was caused by the streetcar. O'Meara left behind his wife Mary and four young children. 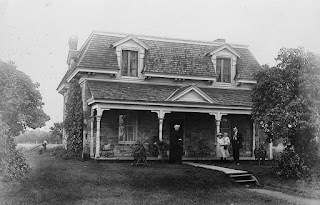 Mary remained in the house until 1914. The other piece of bad news from the home's brief history is simply that it disappeared around 1920, demolished or most likely lost to a fire. 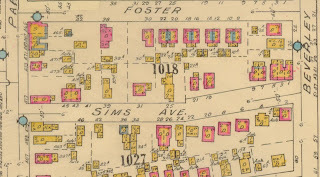 The next step of significance for the street came on June 5th, 1911, when the length of Sims Avenue was doubled by the filing of plan 106706, which extended Sims and Foster to Beverley Avenue. 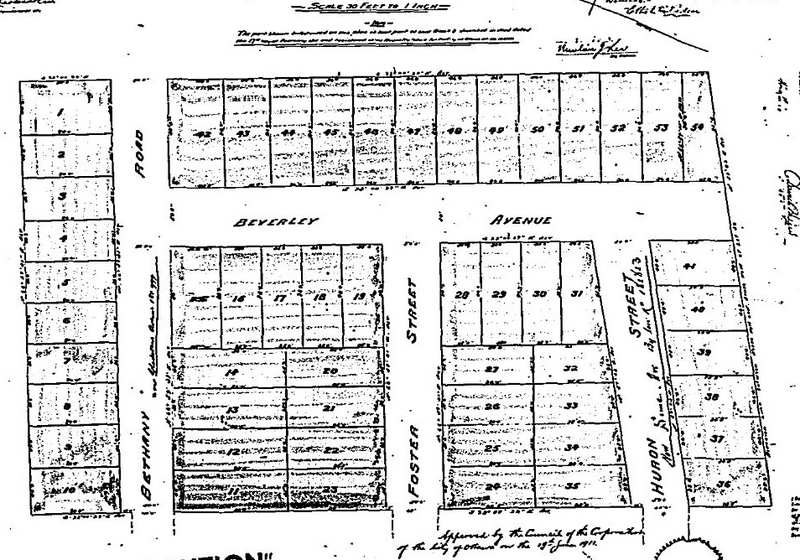 To counteract the declining lot lengths from the original Plan 106, the new plan created the opposite effect, in that it reduced the lot lengths on the north side of the street. As a result, though Gladstone and Foster run perfectly straight from one end to the other, Sims has a distinct "V" shape to it. Between 1914 and 1915, the first construction on this new half occurred when two new dwellings went up on the north side of Sims (still then known as Huron Place): the triplex at the east end (1-3-5 Sims Avenue), and the double next to it (7-9 Sims Avenue). 21 Sims would come a couple of years later, and 19 Sims in 1921. 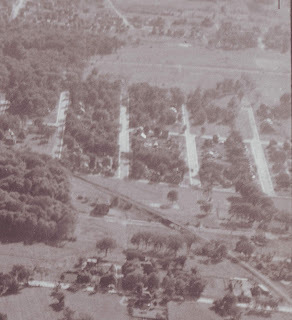 As for the rest of the houses on the north side, 11 and 31 Sims would be built sometime in the 40s or 50s. 39 Sims would be torn down and replaced with a new double at 35-37 Sims. 41 Sims also appears to have been rebuilt at some time, though on the same footprint (possibly with some original components). On the south side, the new segment towards Beverley would actually largely remain vacant lots for many years. In the late 1920s, 2 Sims Avenue at the corner was built by Arthur W. Whitcomb, and it still stands today. But it was not until the mid-late 1940s when 4, 6, 8, 20, and 22 Sims would be constructed. #20 has already been demolished and replaced with a new build in 2015. Old 34 Sims has been replaced by the double at 30-32 Sims, while old 36 Sims has been replaced by the triple unit at 36-38-40 Sims. 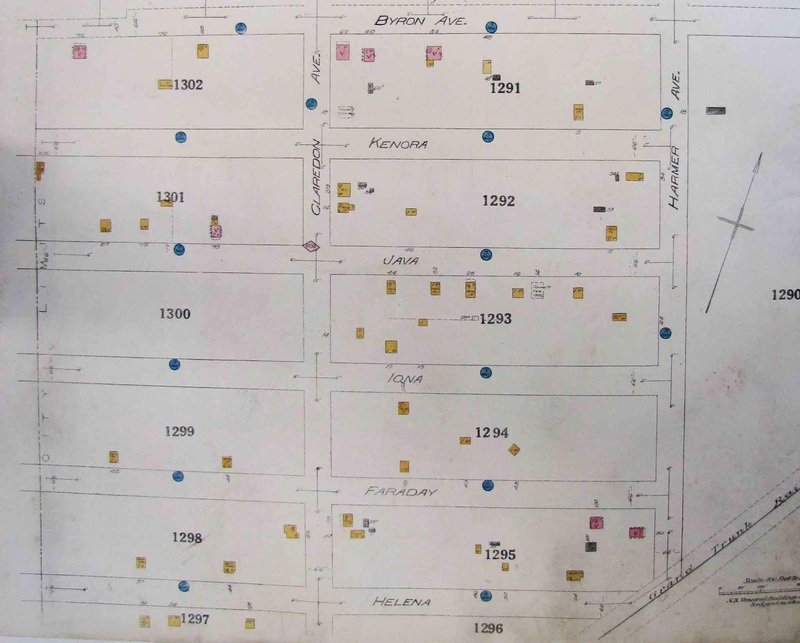 The growth of Sims Avenue can be well illustrated through fire insurance plans, showing the street at different points in time: 1908, 1922 and 1948. Keep in mind that yellow indicates wood construction, pink is where brick has been added, blue is concrete block or stone, and grey is for small sheds or outbuildings, or additions without utilities. The blue circles represent fire hydrants. The first mention of the street, or at least of one of its residents, in the local newspaper, was this funny little news item from 1896, about Thomas Derby's wife Emily (the Derby's lived at 34 Sims). This clipping below is notable because it reminds us that for the first 10+ years of Sims Avenue, there was no water nor sewer service available for residents. James O'Meara applied to the town council to ask for access to the then-three years old water network in Hintonburg, which of course had not gotten as far south as Sims (Albert) by 1902. 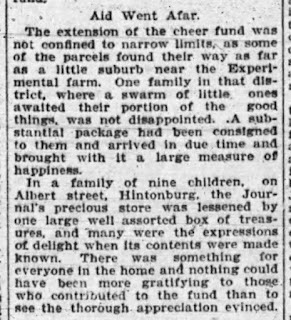 This article appeared in the newspaper at Christmastime, 1902, discussing aid packages delivered by the newspaper to needy families. One such family resided on Albert Street, which I am almost certain was the Desjardins family, who occupied 24 Sims, and had at last 8 children, possibly 9 as per the article. Antoine and Albina Desjardins had all of these children, each almost exactly one year apart in age, the oldest being only 11 years old! Antoine Desjardins made only $300 per year as a carpenter (as per the 1901 census), which was not a lot of money, even in that era. So it is no surprise they appreciated a Christmas package. 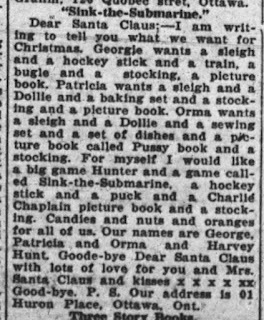 The Ottawa Journal ran children's letters to Santa as a regular feature each December for a number of years. 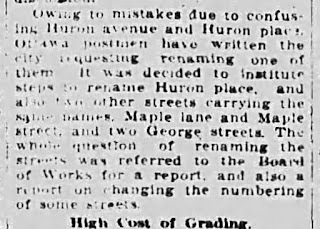 One such letter in 1918 was written by a child living at 1 Huron Place (now 1 Sims). Like every street in Hintonburg, Sims Avenue saw most of its young male population go off to war twice in the first half of the 20th century. 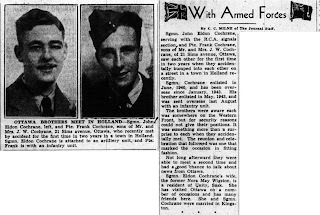 The article below highlights one resident in particular, Robert Lafleur of 46 Sims, son of William and Maria Lafleur, who had a particularly difficult year in the early part of the war, and had witnessed the torpedoing of the original H.M.C.S. Ottawa. Juvenile delinquency was handled in a tough and quick manner back in the 1930s and 1940s. The newspaper was full of the stories of the court cases, with judges handing down hard sentences for teens who were breaking the law. 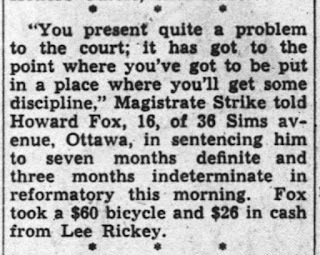 Here a 16-year old is sent to 7-10 months for stealing a bicycle and $26 in cash. Here is another near-tragedy story from 24 Sims. 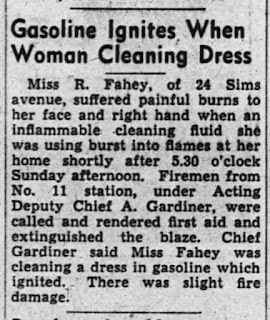 This is by far not the first time I've come across a story about a fire started by someone cleaning clothes using gasoline. 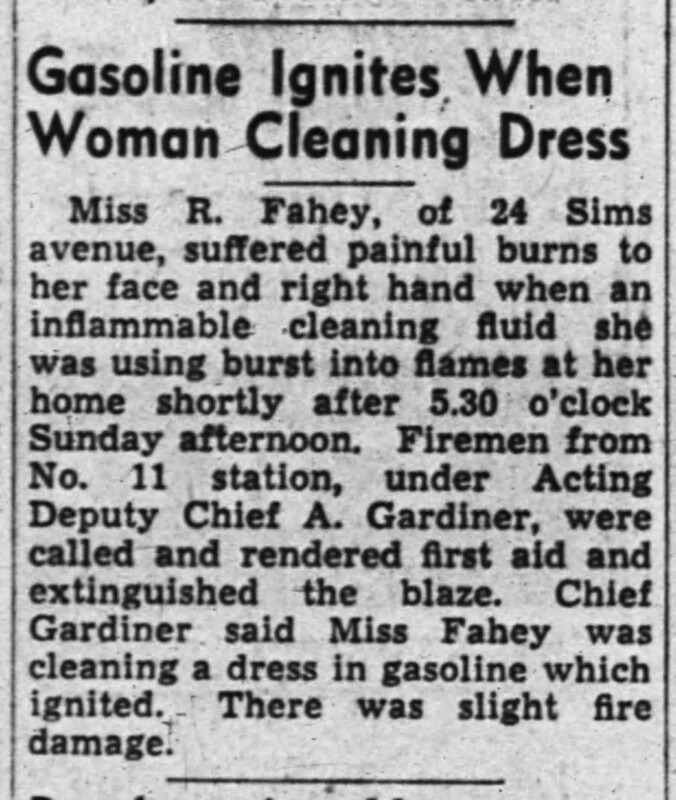 I guess this was pretty common back in the era, when gas itself was becoming more common. 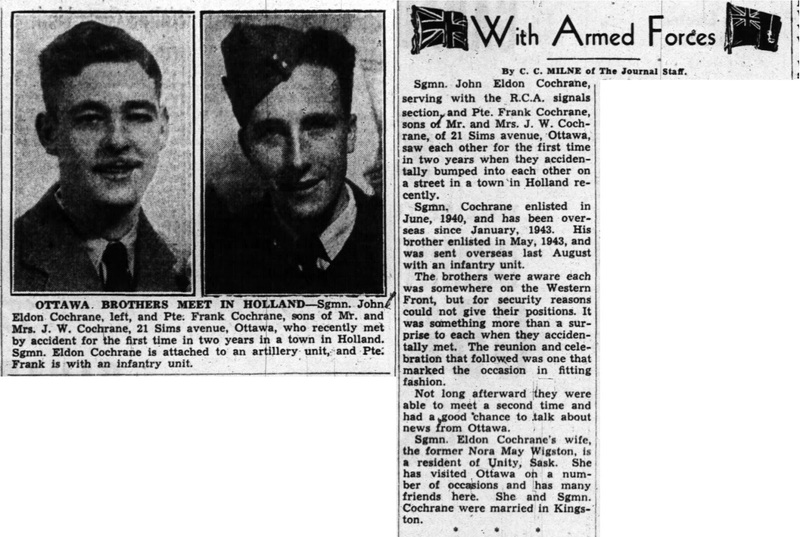 The article below is an amazing story of two brothers from the Cochrane family, long-time occupants of 21 Sims Avenue who happened to run into each other in a small town in Holland in 1945, while soldiers in different units during WWII. 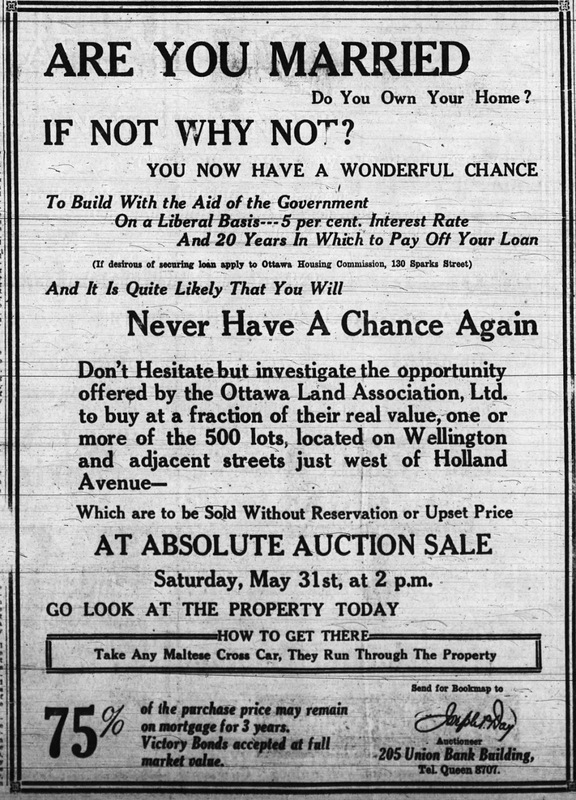 This ad below shows you could still buy a vacant lot on Sims Avenue in 1955 for $1,500! Perhaps the worst of all of the stories from Sims Avenue's history has to be this one. 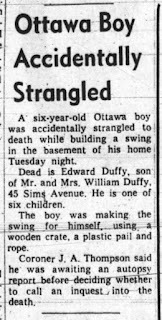 A very tragic report of Edward Duffy, six years old, who accidentally strangled himself on a basement swing in 1965. His family resided at 45 Sims. To close the article, I always like to try to include a few oblique aerial shots, which provide a rare and unique view of the street. 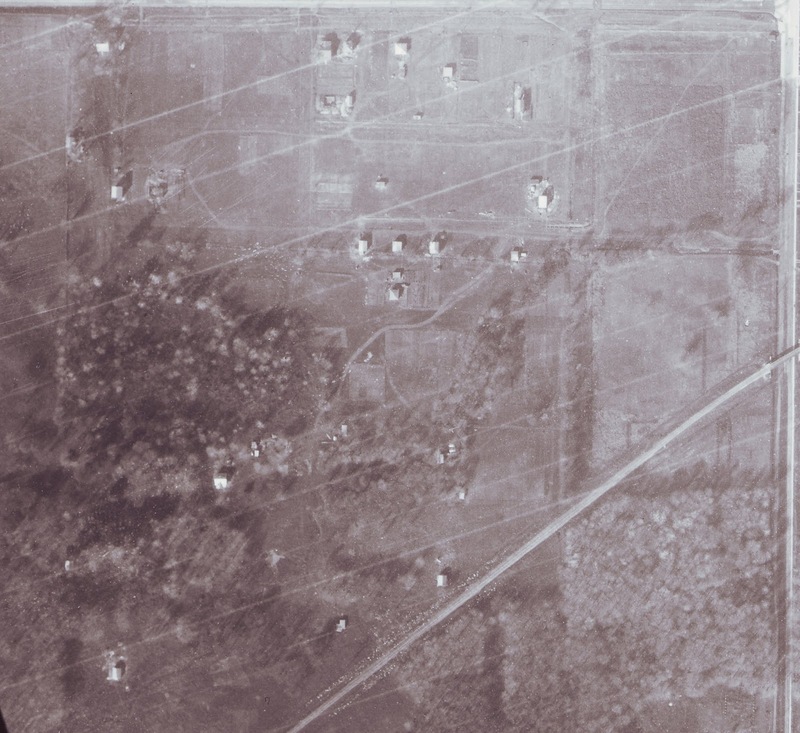 I have a vast collection of such photos thanks to the City Archives and National Aerial Photo Library, and usually can find several high resolution, low elevation shots to include, but oddly Sims just didn't appear on most of the photos. The two vintage photos below are the best I could come up with, and the more recent photo from Bing closes off this detailed, photo-heavy history of Sims Avenue. I hope you enjoyed it! Sims Avenue can be seen at the top in the middle. (Edit July 8/18: Special thanks to Elizabeth Truemner for clarifying a few details about the Fischer family, and Howard Brady their long-time border. The more I hear about the Fischers, the more amazing their story becomes. The Truemners on Parkdale obtained/were gifted several pieces from the Fischer family, and were able to share several additional anecdotes about the family. I will be sure to write a follow-up on the Fischers someday soon).